Over the past two decades, there has been an immense accumulation of evidence stating that a sedentary lifestyle significantly increases the risk of adverse health outcomes such as obesity, type II diabetes, and cardiovascular disease [1-5]. In response to this evidence, standing desks have grown in popularity, especially in the corporate office setting. Since sitting is by far the most popular sedentary position in the United States, the popularization of standing desks appears to be an appropriate response for improving health. However, when critically analyzed, there are many faulty premises associated with the alleged health-improving benefits of the standing desk. This article explains what the standing desk can (and cannot) be expected to do in terms of improving health outcomes. The use of standing desks has been claimed to elicit many health benefits, and the most common claims allege a reduction in rates of obesity, chronic disease, cancer, and postural problems. Media and commercial sources promoting standing desks will often use the phrase “sitting will kill you”. Phrases like this are inaccurate. Sitting does not kill you. Chronic inactivity is just one of many factors that decreases life expectancy, other factors being chronic stress , poor nutrition , and low socioeconomic status . To say that “sitting will kill you” is to make a gross oversimplification. It is more accurate to say, “A sedentary lifestyle, which can occur in the form of chronic prolonged sitting, will increase the risk of adverse health outcomes and resultantly reduce life expectancy”. No one simply dies from sitting, just as no one simply dies from stress, even though both are significant public health concerns that adversely impact the health of millions [1-6]. The key is to understand that “sedentary” and “sitting” are not exactly the same thing. Sitting is just one way to be sedentary. Within the definition of “sedentary”, standing must be included as well because it is a static position that does not appreciably increase one’s energy expenditure . Media sources and corporations may praise the standing desk as the new hallmark of a healthy office, but standing simply does not challenge the musculoskeletal or cardiovascular systems to a significant degree. This fact brings to light a severe fault in the premise that standing desks can improve one’s health. Technically, when compared to sitting, standing does cause the body to burn more calories because postural muscles have to work harder to maintain balance. Also, the cardiovascular system has to increase its work-output in a standing position because blood must be pumped against gravity to a greater degree. However, neither the musculoskeletal or cardiovascular systems are significantly challenged by replacing sitting with standing. Using a standing desk to increase energy expenditure is like trying to reduce caloric intake by forgoing a cherry on the top of your triple scoop ice cream sundae. Yes, there is a difference, but it is negligible, and the overall premise is flawed. Now that we have a clear understanding of what “sedentary” means, we can begin to uncover the faulty premises behind the alleged benefits of standing desks. In a recent comprehensive research review that assessed the effects of using standing desks, the authors stated that there is currently a lack of evidence to support the idea that standing desks can improve health . This contextual fact must be kept in mind when examining the alleged benefits of standing desks. If there is no evidence to support the health benefits of standing desks, what are such alleged benefits based on? As previously stated, it has been found that the standing position may not cause an appreciable increase in energy expenditure compared to sitting . In contradiction, another study found that standing desks significantly increased energy expenditure . However, the study had some notable limitations that were self-admitted (i.e. small sample size and short testing period). Even if the data reported in the study were compelling enough to be generalizable, individuals would have to replace sitting with standing for roughly 6 hours per day to burn an extra 114 calories. The notion that individuals will comply with 6 hours of standing instead of sitting is highly unrealistic. Even if individuals stand 50% of the time in replacement of sitting, which is more plausible but still questionable, the extra daily energy expenditure drops to 57 calories. Standing 25% of the time is far more realistic, which reduces extra daily energy expenditure to roughly 25 calories, a value that is essentially negligible. Out of these two factors, limiting total caloric intake is by far the most important to control. It is very difficult to lose weight by exercising alone without reducing total caloric intake, and it is obvious standing desks do not affect caloric intake. As we already know, standing desks also do not appreciably increase energy expenditure. Therefore, there is no way that standing at a desk, instead of sitting, would stimulate weight loss and reduce/prevent the occurrence of obesity. A standing desk does not affect nutritional habits or stress management, and as previously stated, they also do not significantly impact energy expenditure. Therefore, there is a lack of logic behind the notion that standing desks can contribute to the prevention of chronic diseases. There is evidence suggesting that increasing levels of physical activity can reduce the risk of cancer [18,20,21]. I am beating a dead horse, but the relevance of the point remains – standing does not significantly impact physical activity levels compared to sitting. Therefore, standing desks should not be expected to prevent cancer. Interestingly, in a 2009 study, it was actually found that chronic prolonged sitting did not increase the risk of cancer . Increased life expectancy from using a standing desk is claimed because of alleged benefits #1 through #3, which are all based on faulty premises. Therefore, an increased life expectancy from replacing sitting with standing is predicated on a lack of evidence and weak logic. Improving posture by using a standing desk may actually pass muster, at least in some respects. When the body is seated, certain joints and muscles are held in a shortened position while others are held in a lengthened position. Chronic prolonged sitting encourages tightness in shortened muscles, and contributes to weakness, discomfort, and local ischemia (i.e. impaired blood flow) in lengthened muscles . By standing, you can help normalize tissue length and restore balance to joint positions. The ability to move back and forth between sitting and standing may help some individuals feel more comfortable and less stiff throughout the work day. However, it must be noted that one can still have poor posture while standing. By standing for long periods of time, the plantar tissue in your feet will become ischemic due to chronic compression, and the load bearing joints of the standing position (i.e. ankles, knees, and lower back) can become achy and stiff. Some researchers assert that using standing desks could cause orthopedic problems . The primary key for facilitating healthy posture and overall orthopedic health is frequent and varied movement in all joints of the body. It has been claimed that standing desks increase spontaneous physical activity because a standing individual is in a more mobile position than a sitting individual, and is therefore more likely to move around throughout the day. Examples of spontaneous physical activity include: walking to get a drink, going to talk to a peer, or taking a stretch break. This is not a direct benefit, but rather a potential associative effect of having a standing desk. In a 2016 research review that analyzed the effect of classroom standing desks on the sedentary behavior of students, there were mixed results on whether standing desks increase spontaneous physical activity . If standing desks can promote physical activity, they could indeed contribute to the positive health outcomes associated with alleged benefits #1-#5. Time (and further research) will tell. However, this alleged benefit is based on increasing physical activity, not just replacing sitting with standing. Standing desks do provide some benefits, but they are mild at best. Increases desk-time comfort by providing 2 positions to switch between throughout the workday (direct benefit). Potentially promotes spontaneous physical activity throughout the workday because standing is a more mobilized position than sitting (associative benefit). The degree of these benefits is variable between individuals. Some may find notable improvements by using a standing desk, and others may find the standing position undesirable. Many media and commercial sources have claimed that standing desks provide health benefits (e.g. they help prevent obesity, chronic disease, and postural problems). However, there is simply no current evidence to base such claims on. At best, there is inconclusive and mixed evidence suggesting that standing desks may mildly contribute to positive health outcomes . There have been no well-designed longitudinal studies that examine the long-term health outcomes of replacing a sitting desk with a standing desk. A health innovation does not necessarily require robust supportive research as long as it is grounded in logic. However, the belief that a standing desk will improve health is based in neither evidence nor logic. A fundamental understanding of human physiology tells us that replacing sitting with standing will likely not provide any health benefits, as standing does not significantly challenge the musculoskeletal or cardiovascular systems. Standing falls within the working definition of sedentary, as it is a static position that does not appreciably increase energy expenditure. Attempting to improve health by partially or totally replacing one prolonged static position with another is like trying to make a cricket feel at home by dropping a few blades of grass in the jar it’s kept in. Either work model (i.e. prolonged sitting and/or prolonged standing) is grossly unnatural for the human body. At the end of the day, millions of individuals are still working ad nauseam in front of screens in prolonged static positions. If the health of America’s desk-using workforce is to be improved, we must consider a deeper premise – is the current work model of spending 8+ hours a day in front of a screen while in a static position (or combination of static positions) inherently unhealthy? Will attempting to work within this current model only provide mild health benefits at best? To decrease the adverse health outcomes associated with a sedentary lifestyle, one must engage in frequent bouts of movement on a daily basis. There are many forms of health-promoting physical activity, such as: walking, running, swimming, climbing, biking, sports, lifting weights, yard work, gardening, yoga, tai chi, etc. The form of physical activity does not necessarily matter as long as the musculoskeletal and cardiovascular systems are challenged. Physical activity does not have to be complicated. Muscle fatigue and/or an increased heart rate are the biggest indicators that you are not being sedentary. Standing desks may be a step in the right direction, but they cannot be expected to make a significant impact on the health of the office workforce. A step up from the standing desk is the treadmill desk, which has been shown to significantly increase energy expenditure [12,25]. However, treadmill desks are quite expensive at approximately $1,600 per unit (plus continual maintenance costs) , and there is no guarantee that they will actually be utilized by employees. Also, the treadmill desk seems like an absurdly out of touch attempt at a “fix” on sedentariness; it’s reminiscent of a hamster on a wheel. To improve the health of the office workforce within the current model, the best course of action is to create incentivized wellness programs that promote daily physical activity, rather than spending exorbitant amounts of money on an office full of treadmill desks. Such wellness programs would need to be fashioned on a case-by-case basis to match the desires and expectations of the specific employee population, as enjoyment is a key factor in adherence to any exercise program. Standing desks may provide benefits to some individuals, but they should not be relied upon for improving health; they must function secondarily to the priority of increasing physical activity. Think of standing desks like a dietary supplement. A dietary supplement only provides a mild nutritional benefit when overall nutrition is in good standing. Similarly, standing desks will only provide a mild health benefit when physical activity occurs on a regular basis. A sedentary lifestyle contributes to a host of adverse health outcomes [1-5]. Sitting is the most popular sedentary position in the US. Over the past 2 decades, standing desks have grown in popularity because they allegedly reduce the adverse health outcomes associated with chronic prolonged sitting. However, sedentariness is not limited to sitting. Any static position that does not appreciably increase energy expenditure qualifies as sedentary . Therefore, standing is also sedentary , and it should not be expected to improve health outcomes. The alleged health benefits of replacing sitting desks with standing desks are supported by a meager amount of evidence that is inconclusive and mixed . Treadmill desks are a better option for increasing energy expenditure [12,25], but they are expensive . To promote increases in energy expenditure, resources would be better spent on creating incentivized wellness programs that promote daily physical activity. Such programs should be tailored specifically to the desires and expectations of the specific group they are intended for. Ultimately, any attempt to improve health outcomes in the office workforce must primarily include daily physical activity that appreciably challenges the musculoskeletal and cardiovascular systems. The average American spends significantly more time being inactive when awake than when sleeping (8-9 hours/day compared to 6.8 hours/day, respectively) [26,27]. 1.) Tremblay, M. S., Colley, R. C., Saunders, T. J., Healy, G. N., & Owen, N. (2010). Physiological and health implications of a sedentary lifestyle. Applied Physiology, Nutrition, and Metabolism, 35(6), 725-740. 2.) Manson, J. E., Skerrett, P. J., Greenland, P., & VanItallie, T. B. (2004). The escalating pandemics of obesity and sedentary lifestyle: a call to action for clinicians. Archives of Internal Medicine, 164(3), 249-258. 3.) Chakravarthy, M. V., Joyner, M. J., & Booth, F. W. (2002). An obligation for primary care physicians to prescribe physical activity to sedentary patients to reduce the risk of chronic health conditions. Mayo Clinic Proceedings, 77(2), 165-173. 4.) Wilmot, E. G., Edwardson, C. L., Achana, F. A., Davies, M. J., Gorely, T., Gray, L. J., ... & Biddle, S. J. (2012). Sedentary time in adults and the association with diabetes, cardiovascular disease and death: systematic review and meta-analysis. Diabetologia, 55(11), 2895-2905. 5.) Biswas, A., Oh, P. I., Faulkner, G. E., Bajaj, R. R., Silver, M. A., Mitchell, M. S., & Alter, D. A. (2015). Sedentary time and its association with risk for disease incidence, mortality, and hospitalization in adults: a systematic review and meta-analysis. Annals of Internal Medicine, 162(2), 123-132. 6.) Sapolsky, R. M. (2004). Why zebras don't get ulcers: The acclaimed guide to stress, stress-related diseases, and coping-now revised and updated. Holt Paperbacks. 7.) Dwyer, J. (2006). Starting down the right path: nutrition connections with chronic diseases of later life. The American Journal of Clinical Nutrition, 83(2), 415S-420S. 8.) Stringhini, S., Carmeli, C., Jokela, M., Avendaño, M., Muennig, P., Guida, F., ... & Chadeau-Hyam, M. (2017). Socioeconomic status and the 25× 25 risk factors as determinants of premature mortality: a multicohort study and meta-analysis of 1· 7 million men and women. The Lancet, 389(10075), 1229-1237. 9.) Pate, R. R., O'neill, J. R., & Lobelo, F. (2008). The evolving definition of" sedentary". Exercise and Sport Sciences Reviews, 36(4), 173-178. 11.) Creasy, S. A., Rogers, R. J., Byard, T. D., Kowalsky, R. J., & Jakicic, J. M. (2016). Energy expenditure during acute periods of sitting, standing, and walking. Journal of Physical Activity and Health, 13(6), 573-578. 12.) MacEwen, B. T., MacDonald, D. J., & Burr, J. F. (2015). A systematic review of standing and treadmill desks in the workplace. Preventive Medicine, 70, 50-58. 13.) Reiff, C., Marlatt, K., & Dengel, D. R. (2012). Difference in caloric expenditure in sitting versus standing desks. Journal of Physical Activity and Health, 9(7), 1009-1011. 14.) Pan, X. R., Li, G. W., Hu, Y. H., Wang, J. X., Yang, W. Y., An, Z. X., ... & Jiang, X. G. (1997). Effects of diet and exercise in preventing NIDDM in people with impaired glucose tolerance: the Da Qing IGT and Diabetes Study. Diabetes Care, 20(4), 537-544. 15.) Anderson, J. W., Kendall, C. W., & Jenkins, D. J. (2003). Importance of weight management in type 2 diabetes: review with meta-analysis of clinical studies. Journal of the American College of Nutrition, 22(5), 331-339. 16.) Lefevre, M., Redman, L. M., Heilbronn, L. K., Smith, J. V., Martin, C. K., Rood, J. C., ... & Ravussin, E. (2009). Caloric restriction alone and with exercise improves CVD risk in healthy non-obese individuals. Atherosclerosis, 203(1), 206-213. 17.) Wing, R. R., Lang, W., Wadden, T. A., Safford, M., Knowler, W. C., Bertoni, A. G., ... & Look AHEAD Research Group. (2011). Benefits of modest weight loss in improving cardiovascular risk factors in overweight and obese individuals with type 2 diabetes. Diabetes Care, 34(7), 1481-1486. 18.) Kushi, L. H., Doyle, C., McCullough, M., Rock, C. L., Demark‐Wahnefried, W., Bandera, E. V., ... & Gansler, T. (2012). American Cancer Society guidelines on nutrition and physical activity for cancer prevention. CA: A Cancer Journal for Clinicians, 62(1), 30-67. 19.) Thompson, P. D., Buchner, D., Piña, I. L., Balady, G. J., Williams, M. A., Marcus, B. H., ... & Fletcher, G. F. (2003). Exercise and physical activity in the prevention and treatment of atherosclerotic cardiovascular disease. Circulation, 107(24), 3109-3116. 20.) Friedenreich, C. M., & Orenstein, M. R. (2002). Physical activity and cancer prevention: etiologic evidence and biological mechanisms. The Journal of Nutrition, 132(11), 3456S-3464S. 21.) Lee, I. M. (2003). Physical activity and cancer prevention--data from epidemiologic studies. Medicine and Science in Sports and Exercise, 35(11), 1823-1827. 22.) Katzmarzyk, P. T., Church, T. S., Craig, C. L., & Bouchard, C. (2009). Sitting time and mortality from all causes, cardiovascular disease, and cancer. Medicine & Science in Sports & Exercise, 41(5), 998-1005. 23.) Chaitow, L., & DeLany, J. (2008). Clinical application of neuromuscular techniques: the upper body (Vol. 1). Elsevier Health Sciences. 25.) Levine, J. A., & Miller, J. M. (2007). The energy expenditure of using a “walk-and-work” desk for office workers with obesity. British Journal of Sports Medicine, 41(9), 558-561. 26.) Matthews, C. E., Chen, K. Y., Freedson, P. S., Pate, R. R., Schlundt, D. G., Buchowski, M. S., & Troiano, R. P. (2006). Time spent in sedentary behaviors: United States, 2003-2004. Frontiers in Cancer Prevention Research, 15(12). Chronic sleep deprivation is a significant public health concern that creates costs for both the individual (e.g. increased risk of chronic disease [1-5] and automotive accidents [6-8], and decreased cognitive performance [5,7,9,10-13] and emotional wellbeing [7,14,15]) and society (e.g. economic burden [3,15,17,18]), many of which go unrecognized by the general population [8,16]. Americans have been progressively sleeping less over the course of the past 100+ years [19,20], and over 10% of Americans currently suffer from insomnia [17,21,22], which is a sleep disorder characterized by having chronic difficulty falling asleep and/or staying asleep . However, insomnia is not the sole cause of sleep deprivation, as there are plenty of individuals who have no problem falling asleep and staying asleep, but who still experience sleep deprivation due to poor lifestyle management and/or an abundance of responsibilities. Historically, sleep researchers would only study the effects of 1 to 2 nights of total sleep deprivation (i.e. no sleep whatsoever) with very little focus on the effects of chronic partial sleep deprivation [24,25] (i.e. getting 6 or less hours of sleep per night, for several consecutive nights [7,26]). However, many contemporary sleep researchers have shifted focus onto the effects of chronic partial sleep deprivation, as it is much more common for individuals to sleep poorly for extended periods than it is for them to “pull all-nighters” . This article addresses the effects of both total and partial sleep deprivation. Unfortunately, Americans are largely uninformed about the negative consequences of sleep deprivation [3,8,16], especially compared to other public health concerns such as obesity, heart disease, and type II diabetes. To bring things into perspective, fatal car accidents due to sleep deprivation occur at a similar or greater rate than fatal accidents caused by alcohol intoxication . Drunk driving is vilified by the public, yet the same attitude is hardly directed towards sleep-deprived driving. In fact, working excessive hours while sleep deprived (and subsequently commuting while sleep deprived) is often glorified because it is a trait of the “hard-working American” cultural archetype. Dawson and Reid (1997) found that being awake for 24 continuous hours causes hand-eye coordination impairments comparable to having a 0.10% blood alcohol level  (the legal threshold for drunk driving is 0.08% ). The same researchers also found that moderate levels of fatigue due to partial sleep deprivation can actually cause equal or greater hand-eye coordination impairments than a blood alcohol level associated with intoxication. In addition, work days missed due to insomnia occur at a similar rate to work days missed due to lung disease or diabetes [17,29]. These are just a few examples of the negative consequences of sleep deprivation, albeit powerful. This article will first address the negative consequences of sleep deprivation in more detail, and then provide different methods of improving sleep quality. One of the most profound and thoroughly researched effects of sleep deprivation is impaired vigilance [7,8,11,24,25,27,30,31], and it’s probably the easiest to recognize and understand. It doesn’t take a rigid scientific experiment to convince most people that sleeping poorly will make your mind feel hazy, slow, and less focused. Vigilance is a sense of alertness, awareness, and wakefulness. Put into its most basic terms, vigilance is a perceptual quality that allows you to sense the external world accurately so that you can respond appropriately to it. When vigilance is impaired, it becomes difficult to accurately assess what is going on around you, increasing the likelihood of committing an error. Errors due to impaired vigilance can be as innocuous as accidentally putting your keys in the refrigerator, or as serious as getting into a car accident. Sleep deprivation and vigilance have an inverse relationship; this means that the more sleep deprived you become, the less vigilant you become [7,25,27,30]. This relationship may seem obvious, but what is not obvious is that those who are chronically sleep deprived tend to lack the ability to accurately rate their own level of mental fatigue, resulting in a normalization of impaired vigilance . That is, individuals who are chronically sleep deprived tend not to feel sleepy even though they “function sleepy”. On one hand, this is an example of human adaptability. But on the other hand, this normalization of mental fatigue can be disastrous. Even mild-to-moderate sleep deprivation can significantly impair vigilance [24,27]. Sleep deprivation can be quite hazardous, as reduced vigilance increases the rate of errors that result in injury and fatality. As stated previously, fatal car accidents due to sleep deprivation occur at a similar or greater rate than fatal accidents due to alcohol intoxication, and this is primarily due to impaired or nonexistent vigilance (i.e. falling asleep at the wheel) when driving . In hospitals, extended physician shifts (24+ hours) increase the occurrence of medical errors that cause harm and death to patients . However, it should be noted that the ability to tolerate sleep deprivation varies between individuals , as some individuals are simply better than others at maintaining a healthy level of vigilance while being sleep deprived. As you sleep, your body progressively shifts through different stages of sleep, each of which has unique physiological characteristics. The sleep stages are referred to collectively as “sleep architecture”. As NREM sleep progresses through its 4 stages, sleep becomes “deeper”. REM sleep, which is the sleep stage in which dreaming occurs , follows NREM sleep. Throughout the night, your body cycles through NREM and REM sleep repeatedly. Sleep deprivation disrupts healthy sleep architecture, causing an increase in certain stages, and a decrease in others. One of the most harmful effects of sleep deprivation on sleep architecture is the reduction of time spent in stages 3 and 4 of NREM sleep, also known as “slow wave sleep” [5,10]. Slow wave sleep (SWS) involves particularly restorative physiological processes that play an important role in learning and memory consolidation [5,9,10,12,15,33], although SWS as a whole is not entirely understood . However, is it understood that sleep deprivation, and the consequential reduction of SWS, impairs one’s ability to learn new information and retain memories (particularly fact-based memories) [9,12]. The negative implications of impaired SWS are obvious, as learning and memory-retention are ubiquitous aspects of the human experience. There is also evidence to suggest that low amounts of SWS may impair parts of the brain associated with emotional and behavioral regulation, increasing a tendency towards impulsivity . Maintaining healthy sleep habits may be especially important for older adults, as SWS naturally decreases with age. There appears to be a reciprocal relationship between sleep deprivation and pain sensitivity [35-38]. That is, those who are sleep deprived are more likely to experience pain, and those in pain are more likely to be sleep deprived. It is well understood that those with acute and chronic pain conditions tend to have disrupted sleep patterns, but there is emerging evidence suggesting that sleep deprivation, independent from other factors, may actually cause or contribute to pain . If sleep deprivation increases pain, and pain increases sleep deprivation, the stage is set for a vicious cycle. The question of “Does sleep deprivation increase pain?” is a relatively new and complex area of scientific investigation that has yielded conflicting evidence [35-37]. In one study, 40 hours of total sleep deprivation increased mechanical pain sensitivity (i.e. pain felt due to the application of external pressure on the surface of a body part), although the specific mechanisms for why this occurs is not fully understood . When the study-participants got full nights of recovery sleep, their pain sensitivity returned to normal. The reduction of pain sensitivity due to improved sleep quality has been corroborated by other researchers . In the management of chronic pain conditions, high quality sleep has been found to be an important therapeutic factor . In a more recent study, sleep deprivation was found to significantly increase thermal pain sensitivity (i.e. pain felt due to heat exposure) without causing a general effect on the body’s somatosensory system (i.e. the part of the nervous system that is responsible for sensing touch, temperature, and body positioning) . This finding suggests that sleep deprivation specifically affects nociceptors (i.e. pain receptors); this is notable because it demonstrates that researchers are coming to a closer understanding of the specific physiological mechanisms that underlie the relationship between sleep deprivation and pain. Stress may seem like an ambiguous concept, but being “stressed out” involves several specific physiological responses. When the body experiences stress, the sympathetic nervous system (SNS) activates and stress hormones are released into the blood stream, causing an increase in heart rate, respiratory rate, blood pressure, availability of usable energy, sensory sensitivity (e.g. vision and hearing), and threat perception. This collection of physiological responses is colloquially known as “the fight or flight” response. When the SNS stress response occurs repeatedly over a prolonged period of time, you have chronic stress. When the body is deprived of sleep, it experiences greater levels of stress (i.e. an increase in both SNS activity and stress hormones in the blood) [1,5,11]. Therefore, chronic sleep deprivation can lead to chronic stress. The consequences of chronic stress are severe, so the health implications of getting consistent high-quality sleep are tremendous. Researchers that study the relationship between sleep deprivation and chronic disease have found that being underslept impairs endocrine, metabolic, and cardiac function, increasing the risk of type II diabetes [1,2], obesity , high blood pressure [1,4], and cardiovascular disease [1,4]. Chronic stress can also lead to insomnia. This is highly problematic, as it presents another vicious cycle (the other one being sleep deprivation & pain sensitivity). Being underslept increases stress levels, and higher stress levels make it more difficult to sleep . If gone unchecked, this positive feedback cycle will transform you into a quivering mass of stress that somewhat resembles a human (+1 for hyperbole) until the homeostatic drive for sleep becomes so powerful that you eventually get a full night of sleep. To add further insult to injury, being sleep deprived intensifies negative moods  and decreases your ability to cope with stress [14,15]. Women appear to be less sensitive to the negative effects of sleep deprivation , but it is unclear whether women are able to better tolerate these effects, or if they just experience them to a lesser degree. The majority of car crashes due to sleep deprivation tend to involve younger men , and this may be because women are less sensitive to the negative effects of sleep deprivation. However, compared to men, women are more likely to experience pain disorders that interfere with sleep . Now that we know what can go wrong when humans experience sleep deprivation, the pertinent question is, “What can be done to improve sleep quality?” To understand how to answer this question, we will have to first understand the concept of sleep quality. To increase sleep quality, the goal is to improve all of the above factors. To optimize sleep quality, you will want to minimize sleep onset latency and nocturnal awakenings so that you can maximize slow wave sleep, total sleep time, and sleep efficiency, which will result in an effective use of your total time in bed, leaving you feeling fully rested after your terminal awakening. To be pragmatic, you’ll simply want to reduce sleep onset latency and nocturnal awakenings, as they are the most important factors of sleep quality. The following sections of this article describe and compare different methods of improving sleep quality. Hypnotic drugs (e.g. benzodiazepines and z-drugs) are commonly prescribed to individuals suffering from insomnia , despite the fact that there are non-pharmacological interventions that are shown to be more effective in treating insomnia [23,43,44]. The use of prescription sleep aids is more common in America compared to other countries . Hypnotic drugs have been found to significantly increase total sleep time in individuals with insomnia, at least in the short term [23,44,46-48]. However, the effectiveness of hypnotic drugs comes with a price – negative side effects [23,42,46,47,49-53]. In addition, a fair amount of the scientific literature on the effectiveness of prescription sleep aids had involvement/funding from pharmaceutical companies and private sources, indicating a clear bias [42,47], which suggests that positive outcomes were likely over-represented and negative outcomes were under-represented. *Reduction in natural production of melatonin may partially explain why prescription sleep medication can lead to rebound insomnia, withdrawal, and dependency (more on melatonin later in this article). **A decrease in Slow Wave Sleep (SWS) is a troublesome side effect. As stated previously, SWS involves particularly restorative physiological processes that play an important role in learning and memory consolidation [5,9,10,12,15,33]. Therefore, prescription sleep medication may improve total sleep time, but the quality of that sleep may be low. Also, impaired cognitive performance and memory, which are also side effects of sleep medication, may stem from reduced SWS. *** The elderly appear to be particularly sensitive to the negative side effects of prescription sleep medication, especially in individuals with cognitive impairment and a high fall risk . With all the possible side effects associated with prescription sleep medication, a relevant question to ask is, “Would I rather feel bad from being sleep deprived, or would I rather get a full night of sleep with medication, but then feel bad anyway?” Of course, the individual response to the negative effects of sleep medication is variable. Despite the potential negative effects, prescription sleep aids can be useful for individuals who experience situational insomnia (i.e. insomnia due to time-zone shifts, sleeping in unfamiliar places, and sleeping in places where it is impossible to control environmental variables such as light, sound, and vibrations). With a specific and short-term application of sleep medication for situational insomnia, dependency & withdrawal is not likely to occur, and individuals will not be chronically subjected to negative side effects. As stated in the previous section, there are methods of improving sleep that are more effective than prescription medication, the most prominent method being Cognitive Behavioral Therapy (CBT) [22,23,43,44]. CBT addresses the relationship between your thoughts, emotions, and behavior, and reveals how that relationship negatively affects your sleep patterns . Irwin et al. (2006) state that, "Cognitive therapy breaks dysfunctional beliefs and attitudes about sleep that lead to emotional distress and further sleep problems." For example, an individual who has experienced regular insomnia may develop a negative association with the act of lying down in bed to go to sleep, so much so that simply being in bed triggers a stress response and feelings of anxiety. The stress and anxiety will consequently impair his ability to fall asleep, further engraining the negative association with his bed. Going deeper into this example, let’s say that the individual originally developed insomnia due to psychological stress that was unrelated to sleeping. Then, through the vicious cycle of stress inciting sleep deprivation & sleep deprivation inciting stress, the individual developed a negative association with going to bed, which further perpetuated his sleep problems. Thus, the insomnia developed primarily from a psychological origin, indicating that some form of psychotherapy (in this case, CBT) would be the best treatment option. This is essentially a process of personal empowerment, which is why CBT yields long-term improvements in sleep quality. Once you recognize how to manage your thoughts and behavior effectively to promote restful sleep, you will always have those skills at your disposal. The pharmacological treatment of insomnia only yields short-term benefits because it is a passive intervention that requires no effort or change on the part of the individual. While CBT is effective for improving sleep quality, you will want to see a therapist who specializes in sleep medicine CBT in order to get the best results, as there are many kinds of CBT . To find a therapist certified in behavioral sleep medicine CBT, click here. There are other behavioral therapies besides CBT that are effective, and they don’t necessarily require a therapist in order for them to be understood and utilized. Behavioral therapy focuses more on how certain behaviors (or habits) negatively affect your life, without necessarily including the cognitive component . The goal of Sleep Restriction Therapy (SRT) is to have the total sleep time be as close as possible to the total time spent in bed. This is done by adhering to a rigid wake-up time, regardless of how tired you may feel in the morning . The process of SRT can leave you feeling significantly fatigued in the short-term because you are intentionally getting up while being underslept . However, this short-term discomfort leads to long-term benefits, as being underslept will increase the homeostatic drive for sleep (i.e. the natural impulse for desiring sleep). By accumulating the need for sleep, in combination with waking up at a consistent daily time, you increase sleep quality* and fortify a healthy circadian rhythm (i.e. your body’s natural sleep pattern) [23,55]. *Reduced sleep onset latency, reduced nocturnal awakenings, and increased time spent in slow wave sleep. A woman has a hard time going to sleep on weekdays, and has to arise at 5am in order to be on time for work. She goes to bed at 9:00pm, but doesn’t fall asleep until 10pm. She wakes up several times during the night, which adds up to a total of 1 hour of nocturnal wakefulness. She wakes up at 4:30am because she is anxiously anticipating the work day ahead of her, but she stays in bed until the alarm goes off at 5am. Her total time spent in bed is 8 hours (9pm to 5am), but her total sleep time is 5.5 hours (1 hour to initially fall asleep + 1 hour of nocturnal wakefulness + terminal awakening 0.5 hours before her alarm goes off). On the weekend, she sleeps in late until 10am in order to recover from the accumulated sleep deprivation she experienced throughout the week. Then the weekdays arrive again, and she continues to sleep poorly in the fashion outlined above. In this example, the woman swings from being underslept on weekdays to being overslept on the weekends by making extreme changes to her wake-up time (4:30am to 10am). This “consistent inconsistency” of her sleep pattern destabilizes her natural circadian rhythm, which is one of the reasons why she has such a hard time sleeping well on the weekdays. The woman begins SRT. On the weekend, she no longer wakes up at 10am, but adheres to a consistent wake-up time of 5am. She trudges through the necessary fatigue for the first couple weeks, but over time, her sleep quality drastically improves, and she feels consistently well rested. She goes to bed at 9pm, and falls asleep at 9:30pm. She wakes up a few times during the night, but falls back to sleep relatively quickly, accumulating a total nocturnal wakefulness of 30 minutes. She sleeps deeply until her alarm goes off at 5am. Her total time spent in bed is 8 hours (9pm to 5am), and her total sleep time is 7 hours (0.5 hours to initially fall asleep + 0.25 hours of nocturnal wakefulness). Her sleep efficiency = [7 total hours slept]/[8 total hours in bed] = ~90% (much improved from ~70% before SRT). Essentially, SRT exploits the effects of sleep deprivation in a therapeutic way in order to improve sleep quality and fortify a healthy circadian rhythm. The success of SRT is dependent on the individual’s consistency in adhering to a rigid wake-up time. One important note on SRT: napping is highly discouraged because it will decrease the natural sleep impulse felt at night, making it more difficult to fall asleep [55,56]. For a brief primer on SRT, click here. According to Irwin et al. (2006), the goal of Stimulus Control Therapy (SCT) is to “help individuals renew the association of bed and bedtime stimuli with sleep rather than sleep disruption.”  For example, if you sit in your bed to make business calls, you will start to associate your bed with stressful tasks that require a high cognitive output. Over time, this behavior can interfere with your sleep because you are likely to revisit the stressful mental state associated with business calls when lying in bed at night. SCT helps the individual develop a positive relationship with the bedroom in order to minimize stress and maximize sleep quality. SRT and SCT are often used in conjunction with CBT to optimize improvements in sleep quality . Despite their effectiveness, behavioral therapies are not widely used in the treatment of sleep disorders because medical professionals often don’t refer patients to them . Unfortunately, the majority of medical professionals and patients are unaware of the effectiveness of CBT and other behavioral therapies [16,23,52]. Behavioral therapies are effective because unhealthy behaviors are often the cause of poor sleep in the first place. CBT is used to identify negative thoughts, beliefs, and emotions that lead to unhealthy behaviors surrounding sleep. SRT is used to reverse the adverse effects of having an inconsistent sleep schedule, and SCT is used to reverse the adverse effects of regularly engaging in stressful/stimulating activities in the bedroom. Note that the primary method for restoring health in all of the above examples is behavioral. More often than not, behavior is the most important factor to consider when improving one’s health. Individuals with insomnia tend to have poor sleep hygiene [59,60]. If you have insomnia and are trying to improve your sleep quality, sleep hygiene is a great place to start. Think of sleep hygiene as the first line of defense against insomnia, as it involves putting commonsense considerations into practice. Sleep hygiene can be effective on its own, but it is best used in conjunction with behavioral therapies such as CBT, SRT, and SCT . While sleep hygiene is similar to behavioral therapy, it is not a specific protocoled therapy. Sleep hygiene practices can be used on your own without the guidance of a therapist. Out of all the sleep hygiene guidelines, one is of particular importance – the avoidance of bright light at night. Exposure to bright light at night can significantly disrupt the body’s circadian rhythm [64,65]. Environmental light acts as a “zeitgeber”, that is, an environmental stimulus that synchronizes the body’s circadian rhythm to the light/dark pattern of the 24 hour day . The zeitgeber of light is a powerful evolutionary mechanism that harmonizes the body’s function (i.e. sleep/wake cycle) with the earth’s function (i.e. axial rotation and orbit around the sun) . In simpler terms, when you are exposed to sunlight, you become wakeful, and when the sun goes down, you become sleepy. However, with modern technology, humans can be exposed to bright light no matter the time of day, causing a disruption of the circadian rhythm. When the eyes are exposed to bright light when it is normally dark, the body shifts to a state that is more wakeful, vigilant, and energetic. In addition, exposure to bright light at night decreases the nocturnal secretion of melatonin [62,63], which is a hormone that makes you feel sleepy. So if you are having a hard time falling asleep at night, limit exposure to bright light in the hours leading up to bed, otherwise you are behaving in a way that goes against hundreds of thousands of years of evolution. The following tables offer a comprehensive list of sleep hygiene variables. The effect of meditation on sleep is a relatively new subject of scientific inquiry, but there is growing evidence suggesting that meditating can improve factors of sleep quality (e.g. shorter sleep onset latency, reduced nocturnal awakenings, and increased time spent in slow wave sleep) [66-71]. In addition to improving sleep quality, meditation has also been found to be effective in mitigating some of the negative consequences of sleep deprivation (e.g. impaired reaction time, fatigue, depression, decreased ability to cope with stress, and increased inflammatory biomarkers [67,70,72]. Meditation helps decrease sympathetic nervous system (SNS) activity. Remember, the SNS is responsible for the “fight or flight” stress response. Chronic SNS activity impairs sleep quality. Therefore, calming the SNS through meditation can improve sleep quality. Meditation increases awareness of internal psychological processes (i.e. thoughts, beliefs, and emotions), helping you recognize mental patterns that lead to stress. By recognizing these stress-inducing patterns, you are better able to address them, helping you reduce stress, and therefore improve sleep quality. Essentially, meditation improves sleep quality because it is an effective way to manage stress. Chronic stress can severely reduce sleep quality , so stress management is paramount when trying to improve sleep quality. In addition to helping manage stress, meditation can actually alter your sleep architecture by increasing the time spent in slow wave sleep (i.e. highly restorative deep sleep stages) and REM sleep [68,69,71]. This fact is especially pertinent for older adults who sleep poorly, as slow wave sleep naturally decreases with age . In certain cases, meditation was found to be more effective than sleep hygiene , and some sleep researchers have asserted that meditation may be a better choice than CBT because it is more accessible (i.e. it doesn’t require a therapist, and it’s free) . Meditation, like CBT, can elicit long-lasting benefits to sleep quality because it empowers the individual to manage their stresses through an increased awareness of negative thoughts and behaviors . However, you don’t have to use meditation at the exclusion of other sleep improvement methods. Aspects of CBT, SRT, SCT, sleep hygiene, and meditation can be used in conjunction with each other, in a personalized way, to reap the greatest benefits in sleep quality. Melatonin is a hormone that is produced and secreted by the pineal gland [49,86], and there is evidence to suggest that it plays a powerful role in regulating the body’s circadian rhythm [49,62,87]. When melatonin is released into the blood stream, the body is cued that it is “biological night” and feelings of sleepiness start to occur [62,87]. Melatonin does not cause the body to suddenly fall asleep, but it quickens the transition of wakefulness to sleep [86,87]. Melatonin supplementation has been found to be an effective method of improving sleep quality, although dosage-timing appears to be a significant factor in its effectiveness [49,50,62,86,88,89]. While product labels often suggest consuming melatonin about 30-60 minutes before bed, current experimental evidence shows that it is actually most effective to take it in the early evening [50,88,89]. In a study that found melatonin to be as effective as prescription sleep medication, taking a dose right before bed had no effect on sleep quality, but a dose taken in the early evening elicited a profound improvement in sleep quality . There is conflicting evidence on the effectiveness of melatonin as a sleep aid , and sensitivity to dosage-timing may partially explain why. Relatively small doses (i.e. 0.3 to 1.0 mg) of melatonin can improve sleep quality [50,86,88,89], but keep in mind that the timing of the dosage may be much more important than the quantity of the dosage . The dosages found in over-the-counter melatonin supplements tend to be much greater than the dosages found to be effective in scientific studies (up to 10 mg compared to ~1mg, respectively). While melatonin has a relatively low bioavailability (i.e. a significant percentage of ingested melatonin does not get absorbed into the blood) , dosages exceeding 1.0 mg do not appear to be necessary. By consuming melatonin during a time when your body doesn’t naturally release it (i.e. the early evening), the concentration of melatonin in your blood increases to a level that would normally occur when your body does naturally release it (i.e. around the time leading up to bed). By increasing your melatonin levels through the evening with supplementation, you can cause an overlap with your body’s natural release of melatonin at night, so that you have a continuous concentration of melatonin in the blood from early evening to night. It is theorized that this overlap of exogenous (i.e. synthetic) melatonin with endogenous (i.e. the body’s own) melatonin can cause a phase advance (i.e. the body shifts to an earlier natural bed time), thus improving the ability to fall asleep . The graph below demonstrates the general hypothesized concept behind the supplemented & natural melatonin overlap that causes an earlier natural bedtime. In contrast, if you supplement with melatonin right before bed, as is commonly suggested on product labels, your body likely already has a relatively strong concentration of melatonin in the blood, so exogenous melatonin may have a negligible effect (more is not necessarily better). However, for those who have abnormally low levels of melatonin at night, which could result from a variety of reasons, supplementing with melatonin right before bed could be effective in improving sleep quality. It is important to remember that melatonin facilitates sleep, but does not cause it [86,87]. There is no scientific consensus on whether or not melatonin is an effective sleep aid for the general population [49,62], as there is large variability between individuals (i.e. some experience significant improvements in sleep quality, and others experience little to no benefits) . For melatonin to work most effectively, you will want to follow sleep hygiene guidelines, such as engaging in relaxing activities and avoiding bright light in the time leading up to bed [62,86]. Also, the dosages and timing of melatonin can be experimented with to see what works best for you. As a general rule, start conservatively with dosages, and never exceed the usage directions printed on the product labels. Melatonin is a valuable supplement for those that it works for, as it is much cheaper and more accessible than prescription sleep aids (e.g. benzodiazepines and z-drugs) , but without the laundry list of negative side effects . In one study, melatonin was actually found to be as effective as prescription sleep aids . Blind individuals whose circadian rhythm cannot be anchored by the light/dark cycle of the 24 hour day . Individuals traveling across time zones who need to calibrate their circadian rhythm to the new time zone (in this case there is dissonance between biological night and geographical night, aka “jet lag”) [49,87]. Night shift workers who sleep during the day . Individuals who live near the poles and as a result do not experience the same light/dark cycle that most humans do . Individuals who work indoors without windows and/or areas with dim lighting . The goal of this article was to explain the negative consequences of sleep deprivation and describe different methods that can improve sleep quality. Remember that you do not have to limit yourself to using just one of the above methods. Any combination of sleep improvement methods can be utilized. Individual responses will vary between the methods, so experiment with them to see what works best for you. Some may experience significant benefits with daily meditation, and others may not. Perhaps following sleep hygiene guidelines in conjunction with melatonin supplementation will give you great results. Depending on your lifestyle, some methods may be more pragmatic than others. If you regularly sleep poorly, it’s definitely worth the time to investigate these different methods of improving sleep. Many Americans are forced to sacrifice sleep, and therefore their health, in order to fulfill responsibilities associated with work, family, school, and social circles. Despite the promises that advanced technology will bring us more leisure time, people are sleeping less now than they were 100 years ago [19,20]. The relationship between human function and advanced technology is highly complex, and many of its long-term consequences, both positive and negative, are unforeseeable. Advanced technology, combined with cultural values that prioritize economic productivity above all else, is a recipe for poor health. Sleep is a fundamental biological process that is necessary for healthy living. If sleep were not essential, humans would not have evolved to spend roughly 8 hours a day doing it. The fact that so many individuals are unaware of the importance of sleep demonstrates how unhealthy our cultural values are, and how detached we are from the intuitive sense of what our bodies need. 1. Spiegel, K., Leproult, R., & Van Cauter, E. (1999). Impact of sleep debt on metabolic and endocrine function. The Lancet, 354(9188), 1435-1439. 2. Knutson, K. L., Spiegel, K., Penev, P., & Van Cauter, E. (2007). The metabolic consequences of sleep deprivation. Sleep Medicine Reviews, 11(3), 163-178. 3. Altevogt, B. M., & Colten, H. R. (Eds.). (2006). Sleep disorders and sleep deprivation: an unmet public health problem. National Academies Press. 4. Mullington, J. M., Haack, M., Toth, M., Serrador, J. M., & Meier-Ewert, H. K. (2009). Cardiovascular, inflammatory, and metabolic consequences of sleep deprivation. Progress in Cardiovascular Diseases, 51(4), 294-302. 5. Sapolsky, R. M. (2004). Why zebras don't get ulcers: The acclaimed guide to stress, stress-related diseases, and coping-now revised and updated. Holt Paperbacks. 6. Banks, S., & Dinges, D. F. (2007). Behavioral and physiological consequences of sleep restriction. Journal of Clinical Sleep Medicine: Official Publication of the American Academy of Sleep Medicine, 3(5), 519. 7. Durmer, J. S., & Dinges, D. F. (2005, March). Neurocognitive consequences of sleep deprivation. Seminars in Neurology, 25(1), 117-129. 8. Pack, A. I., Pack, A. M., Rodgman, E., Cucchiara, A., Dinges, D. F., & Schwab, C. W. (1995). Characteristics of crashes attributed to the driver having fallen asleep. Accident Analysis & Prevention, 27(6), 769-775. 9. Peigneux, P., Laureys, S., Fuchs, S., Collette, F., Perrin, F., Reggers, J., ... & Luxen, A. (2004). Are spatial memories strengthened in the human hippocampus during slow wave sleep? Neuron, 44(3), 535-545. 10. Walker, M. P. (2009). The role of slow wave sleep in memory processing. Journal of clinical sleep medicine: Journal of Clinical Sleep Medicine: Official Publication of the American Academy of Sleep Medicine, 5(2 Suppl), S20. 11. Joo, E. Y., Yoon, C. W., Koo, D. L., Kim, D., & Hong, S. B. (2012). Adverse effects of 24 hours of sleep deprivation on cognition and stress hormones. Journal of Clinical Neurology, 8(2), 146-150. 12. Marshall, L., Helgadóttir, H., Mölle, M., & Born, J. (2006). Boosting slow oscillations during sleep potentiates memory. Nature, 444(7119), 610. 13. Acheson, A., Richards, J. B., & de Wit, H. (2007). Effects of sleep deprivation on impulsive behaviors in men and women. Physiology & Behavior, 91(5), 579-587. 14. Killgore, W. D., Kahn-Greene, E. T., Lipizzi, E. L., Newman, R. A., Kamimori, G. H., & Balkin, T. J. (2008). Sleep deprivation reduces perceived emotional intelligence and constructive thinking skills. Sleep Medicine, 9(5), 517-526. 15. Maquet, P., Degueldre, C., Delfiore, G., Aerts, J., Péters, J. M., Luxen, A., & Franck, G. (1997). Functional neuroanatomy of human slow wave sleep. Journal of Neuroscience, 17(8), 2807-2812. 16. Siebern, A. T., Suh, S., & Nowakowski, S. (2012). Non-pharmacological treatment of insomnia. Neurotherapeutics, 9(4), 717-727. 17. Simon, G. E., & VonKorff, M. (1997). Prevalence, burden, and treatment of insomnia in primary care. American Journal of Psychiatry, 154(10), 1417. 18. Walsh, J. K., & Engelhardt, C. L. (1999). 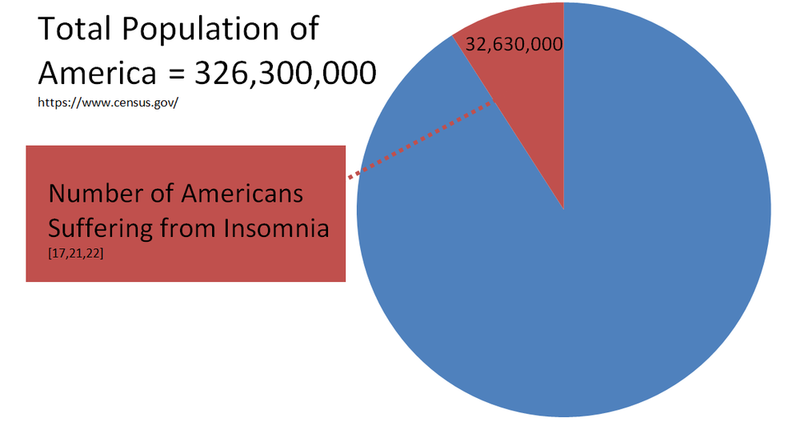 The direct economic costs of insomnia in the United States for 1995. Sleep, 22, S386-93. 19. Webb, W. B., & Agnew, H. W. (1975). Are we chronically sleep deprived? Bulletin of the Psychonomic Society, 6(1), 47-48. 20. National Sleep Foundation. “Sleep in America” poll. Washington DC: National Sleep Foundation; 2006. 21. Chesson Jr, A. L., Anderson, W. M., Littner, M., Davila, D., Hartse, K., Johnson, S., ... & Rafecas, J. (1999). Practice parameters for the nonpharmacologic treatment of chronic insomnia. Sleep, 22(8), 1128-1133. 22. Irwin, M. R., Cole, J. C., & Nicassio, P. M. (2006). Comparative meta-analysis of behavioral interventions for insomnia and their efficacy in middle-aged adults and in older adults 55+ years of age. Health Psychology, 25(1), 3-14. 23. Jacobs, G. D., Pace-Schott, E. F., Stickgold, R., & Otto, M. W. (2004). Cognitive behavior therapy and pharmacotherapy for insomnia: a randomized controlled trial and direct comparison. Archives of Internal Medicine, 164(17), 1888-1896. 24. Vgontzas, A. N., Zoumakis, E., Bixler, E. O., Lin, H. M., Follett, H., Kales, A., & Chrousos, G. P. (2004). Adverse effects of modest sleep restriction on sleepiness, performance, and inflammatory cytokines. Journal of Clinical Endocrinology & Metabolism, 89(5), 2119-2126. 25. Van Dongen, H. P., Maislin, G., Mullington, J. M., & Dinges, D. F. (2003). The cumulative cost of additional wakefulness: dose-response effects on neurobehavioral functions and sleep physiology from chronic sleep restriction and total sleep deprivation. Sleep, 26(2), 117-126. 26. Brown, F. C., Buboltz Jr, W. C., & Soper, B. (2002). Relationship of sleep hygiene awareness, sleep hygiene practices, and sleep quality in university students. Behavioral Medicine, 28(1), 33-38. 27. Dawson, D., & Reid, K. (1997). Fatigue, alcohol and performance impairment. Nature, 388(6639), 235. 29. Wells, K. B., Stewart, A., Hays, R. D., Burnam, M. A., Rogers, W., Daniels, M., ... & Ware, J. (1989). The functioning and well-being of depressed patients: results from the Medical Outcomes Study. Journal of the American Medical Association, 262(7), 914-919. 30. Belenky, G., Wesensten, N. J., Thorne, D. R., Thomas, M. L., Sing, H. C., Redmond, D. P., ... & Balkin, T. J. (2003). Patterns of performance degradation and restoration during sleep restriction and subsequent recovery: A sleep dose‐response study. Journal of Sleep Research, 12(1), 1-12. 31. Lockley, S. W., Barger, L. K., Ayas, N. T., Rothschild, J. M., Czeisler, C. A., & Landrigan, C. P. (2007). Effects of health care provider work hours and sleep deprivation on safety and performance. The Joint Commission Journal on Quality and Patient Safety, 33(11), 7-18. 32. LaBerge, S., & Rheingold, H. (1991). Exploring the world of lucid dreaming. New York: Ballantine Books. 33. Van Cauter, E., Leproult, R., & Plat, L. (2000). Age-related changes in slow wave sleep and REM sleep and relationship with growth hormone and cortisol levels in healthy men. Journal of the American Medical Association, 284(7), 861-868. 34. Roth, T. (2009). Slow wave sleep: does it matter?. Journal of clinical sleep medicine: Journal of Clinical Sleep Medicine: Official Publication of the American Academy of Sleep Medicine, 5(2 Suppl), S4. 35. Kundermann, B., Spernal, J., Huber, M. T., Krieg, J. C., & Lautenbacher, S. (2004). Sleep deprivation affects thermal pain thresholds but not somatosensory thresholds in healthy volunteers. Psychosomatic Medicine, 66(6), 932-937. 36. Lautenbacher, S., Kundermann, B., & Krieg, J. C. (2006). Sleep deprivation and pain perception. Sleep Medicine Reviews, 10(5), 357-369. 37. Onen, S. H., Alloui, A., Gross, A., Eschallier, A., & Dubray, C. (2001). The effects of total sleep deprivation, selective sleep interruption and sleep recovery on pain tolerance thresholds in healthy subjects. Journal of Sleep Research, 10(1), 35-42. 38. Moldofsky, H. (2001). Sleep and pain. Sleep Medicine Reviews, 5(5), 385-396. 39. Adam, T. C., & Epel, E. S. (2007). Stress, eating and the reward system. Physiology & Behavior, 91(4), 449-458. 40. Groesz, L. M., et al. (2012). What is eating you? Stress and the drive to eat. Appetite, 58(2), 717-721. 41. Torres, S. J., & Nowson, C. A. (2007). Relationship between stress, eating behavior, and obesity. Nutrition, 23(11), 887-894. 42. Dündar, Y., Dodd, S., Strobl, J., Boland, A., Dickson, R., & Walley, T. (2004). Comparative efficacy of newer hypnotic drugs for the short‐term management of insomnia: a systematic review and meta‐analysis. Human Psychopharmacology: Clinical and Experimental, 19(5), 305-322. 43. Omvik, S., Pallesen, S., Havik, O. E., Kvale, G., & Nordhus, I. H. (2006). Cognitive behavioral therapy vs zopiclone for treatment of chronic primary insomnia in older adults: a randomized controlled trial. Journal of the American Medical Association, 295(24), 2851-2858. 44. Smith, M. T., Perlis, M. L., Park, A., Smith, M. S., Pennington, J., Giles, D. E., & Buysse, D. J. (2002). Comparative meta-analysis of pharmacotherapy and behavior therapy for persistent insomnia. American Journal of Psychiatry, 159(1), 5-11. 45. LeBourgeois, M. K., Giannotti, F., Cortesi, F., Wolfson, A. R., & Harsh, J. (2005). The relationship between reported sleep quality and sleep hygiene in Italian and American adolescents. Pediatrics, 115(Supplement 1), 257-265. 46. Glass, J., Lanctôt, K. L., Herrmann, N., Sproule, B. A., & Busto, U. E. (2005). Sedative hypnotics in older people with insomnia: meta-analysis of risks and benefits. British Medical Journal, 331(7526), 1169. 47. Buscemi, N., Vandermeer, B., Friesen, C., Bialy, L., Tubman, M., Ospina, M., ... & Witmans, M. (2007). The efficacy and safety of drug treatments for chronic insomnia in adults: a meta-analysis of RCTs. Journal of General Internal Medicine, 22(9), 1335. 48. Huedo-Medina, T. B., Kirsch, I., Middlemass, J., Klonizakis, M., & Siriwardena, A. N. (2012). Effectiveness of non-benzodiazepine hypnotics in treatment of adult insomnia: meta-analysis of data submitted to the Food and Drug Administration. British Medical Journal, 345, e8343. 49. Turek, F. W., & Gillette, M. U. (2004). Melatonin, sleep, and circadian rhythms: rationale for development of specific melatonin agonists. Sleep Medicine, 5(6), 523-532. 50. Zhdanova, I. V., Wurtman, R. J., Lynch, H. J., Ives, J. R., Dollins, A. B., Morabito, C., ... & Schomer, D. L. (1995). Sleep‐inducing effects of low doses of melatonin ingested in the evening. Clinical Pharmacology & Therapeutics, 57(5), 552-558. 51. Kabuto, M., Namura, I., & Saitoh, Y. (1986). Nocturnal enhancement of plasma melatonin could be suppressed by benzodiazepines in humans. Endocrinologia Japonica, 33(3), 405-414. 52. Holbrook, A. M., Crowther, R., Lotter, A., Cheng, C., & King, D. (2000). Meta-analysis of benzodiazepine use in the treatment of insomnia. Canadian Medical Association Journal, 162(2), 225-233. 55. Spielman, A. J., Yang, C. M., & Glovinsky, P. B. (2011). Sleep restriction therapy. Behavioral Treatments for Sleep Disorders. Oxford: Elsevier. 56. Werth, E., Dijk, D. J., Achermann, P., & Borbely, A. A. (1996). Dynamics of the sleep EEG after an early evening nap: experimental data and simulations. American Journal of Physiology-Regulatory, Integrative and Comparative Physiology, 271(3), R501-R510. 57. Mastin, D. F., Bryson, J., & Corwyn, R. (2006). 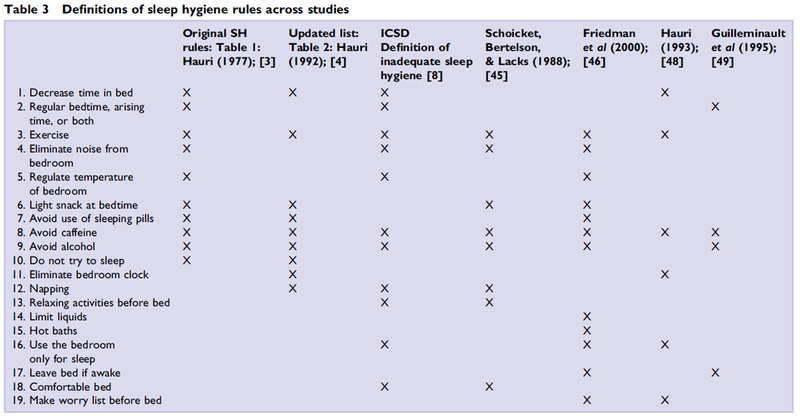 Assessment of sleep hygiene using the Sleep Hygiene Index. Journal of Behavioral Medicine, 29(3), 223-227. 58. Riedel, B.W. (2000). Sleep hygiene. In Lichstein, K. L., and Morin, C. M. (Eds. ), Treatment of Late-life Insomnia, Sage, Thousand Oaks, CA, pp. 125–146. 59. Gellis, L. A., & Lichstein, K. L. (2009). Sleep hygiene practices of good and poor sleepers in the United States: an internet-based study. Behavior Therapy, 40(1), 1-9. 60. Jefferson, C. D., Drake, C. L., Scofield, H. M., Myers, E., McClure, T., Roehrs, T., & Roth, T. (2005). Sleep hygiene practices in a population-based sample of insomniacs. Sleep, 28(5), 611-615. 61. Stepanski, E. J., & Wyatt, J. K. (2003). Use of sleep hygiene in the treatment of insomnia. Sleep Medicine Reviews, 7(3), 215-225. 62. Arendt, J. (2006). Melatonin and human rhythms. Chronobiology International, 23(1-2), 21-37. 63. Gastel, J. A., Roseboom, P. H., Rinaldi, P. A., Weller, J. L., & Klein, D. C. (1998). Melatonin production: proteasomal proteolysis in serotonin N-acetyltransferase regulation. Science, 279(5355), 1358-1360. 64. Berson, D. M., Dunn, F. A., & Takao, M. (2002). Phototransduction by retinal ganglion cells that set the circadian clock. Science, 295(5557), 1070-1073. 65. Czeisler, C. A., Allan, J. S., Strogatz, S. H., Ronda, J. M., Sanchez, R., Rios, C. D., ... & Kronauer, R. E. (1986). Bright light resets the human circadian pacemaker independent of the timing of the sleep-wake cycle. Science, 233, 667-672. 66. Nagendra, R. P., Maruthai, N., & Kutty, B. M. (2012). Meditation and its regulatory role on sleep. Frontiers in Neurology, 3. 67. Black, D. S., O’Reilly, G. A., Olmstead, R., Breen, E. C., & Irwin, M. R. (2015). Mindfulness meditation and improvement in sleep quality and daytime impairment among older adults with sleep disturbances: a randomized clinical trial. Journal of the American Medical Association Internal Medicine, 175(4), 494-501. 68. Pattanashetty, R., Sathiamma, S., Talakkad, S., Nityananda, P., Trichur, R., & Kutty, B. M. (2010). Practitioners of vipassana meditation exhibit enhanced slow wave sleep and REM sleep states across different age groups. Sleep and Biological Rhythms, 8(1), 34-41. 69. Sulekha, S., Thennarasu, K., Vedamurthachar, A., Raju, T. R., & Kutty, B. M. (2006). Evaluation of sleep architecture in practitioners of Sudarshan Kriya yoga and Vipassana meditation. Sleep and Biological Rhythms, 4(3), 207-214. 70. Ong, J. C., Shapiro, S. L., & Manber, R. (2009). Mindfulness meditation and cognitive behavioral therapy for insomnia: a naturalistic 12-month follow-up. Explore: The Journal of Science and Healing, 5(1), 30-36. 71. Mason, L. I., Alexander, C. N., Travis, F. T., Marsh, G., Orme-Johnson, D. W., Gackenbach, J., ... & Walton, K. G. (1997). Electrophysiological Correlates of Higher States of Consciousness During Sleep in Long-Term: Practitioners of the Transcendental Meditation Program. Sleep, 20(2), 102-110. 72. Kaul, P., Passafiume, J., Sargent, R. C., & O'Hara, B. F. (2010). Meditation acutely improves psychomotor vigilance, and may decrease sleep need. Behavioral and Brain Functions, 6(1), 47. 74. Feldman, G., Greeson, J., & Senville, J. (2010). Differential effects of mindful breathing, progressive muscle relaxation, and loving-kindness meditation on decentering and negative reactions to repetitive thoughts. Behaviour Research and Therapy, 48(10), 1002-1011. 75. Erisman, S. M., & Roemer, L. (2010). A preliminary investigation of the effects of experimentally induced mindfulness on emotional responding to film clips. Emotion, 10(1), 72. 76. Garland, E. L. (2007). The meaning of mindfulness: A second-order cybernetics of stress, metacognition, and coping. Complementary Health Practice Review, 12(1), 15-30. 77. Burg, J. M., & Michalak, J. (2011). The healthy quality of mindful breathing: associations with rumination and depression. Cognitive Therapy and Research, 35(2), 179-185. 78. Paul, G., Elam, B., & Verhulst, S. J. (2007). A longitudinal study of students' perceptions of using deep breathing meditation to reduce testing stresses. Teaching and Learning in Medicine, 19(3), 287-292. 79. Barnhofer, T., Chittka, T., Nightingale, H., Visser, C., & Crane, C. (2010). State effects of two forms of meditation on prefrontal EEG asymmetry in previously depressed individuals. Mindfulness, 1(1), 21-27. 80. Vøllestad, J., Sivertsen, B., & Nielsen, G. H. (2011). Mindfulness-based stress reduction for patients with anxiety disorders: Evaluation in a randomized controlled trial. Behaviour Research and Therapy, 49(4), 281-288. 81. Tang, Y. Y., Ma, Y., Fan, Y., Feng, H., Wang, J., Feng, S., ... & Zhang, Y. (2009). Central and autonomic nervous system interaction is altered by short-term meditation. Proceedings of the National Academy of Sciences, 106(22), 8865-8870. 82. Chaiopanont, S. (2008). Hypoglycemic effect of sitting breathing meditation exercise on type 2 diabetes at Wat Khae Nok Primary Health Center in Nonthaburi province. Medical Journal of the Medical Association of Thailand, 91(1), 93. 83. Jerath, R., Edry, J. W., Barnes, V. A., & Jerath, V. (2006). Physiology of long pranayamic breathing: neural respiratory elements may provide a mechanism that explains how slow deep breathing shifts the autonomic nervous system. Medical Hypotheses, 67(3), 566-571. 84. Burg, J. M., Wolf, O. T., & Michalak, J. (2012). Mindfulness as self-regulated attention. Swiss Journal of Psychology. 85. Moss, D. (2004). Heart rate variability (HRV) biofeedback. Psychophysiology Today, 1(1), 4-11. 86. Zhdanova, I. V., Wurtman, R. J., Morabito, C., Piotrovska, V. R., & Lynch, H. J. (1996). Effects of low oral doses of melatonin, given 2–4 hours before habitual bedtime, on sleep in normal young humans. Sleep, 19(5), 423-431. 87. Cajochen, C., Kräuchi, K., & Wirz‐Justice, A. (2003). Role of melatonin in the regulation of human circadian rhythms and sleep. Journal of Neuroendocrinology, 15(4), 432-437. 88. Stone, B. M., Turner, C., Mills, S. L., & Nicholson, A. N. (2000). Hypnotic activity of melatonin. Sleep, 23(5), 663-669. 89. Lewy, A. J., & Sack, R. L. (1997). Exogenous melatonin's phase-shifting effects on the endogenous melatonin profile in sighted humans: a brief review and critique of the literature. Journal of Biological Rhythms, 12(6), 588-594. Modern civilization offers an abundance of instant gratification in the forms of entertainment media, consumer experience, and food, which many of us utilize in order to distract ourselves from negative psychological states such as anxiety, depression, and overthinking. Regarding meditation, it can be difficult to make the decision to disengage from the instantly-gratifying distractions that tend to inundate daily life, and to simply focus on one’s breathing in a quiet manner. Since many of us are conditioned to continually receive stimuli at a high rate throughout the day, it can be uncomfortable to intentionally occupy a quiet space (both internally and externally). However, despite how quiet or serene a meditation environment is, the mind will create its own stimuli in the forms of thoughts, memories, and judgements, as well as emotional responses to all of these things. This article offers a simple program to help turn meditation into a habit. A key factor in the success of any endeavor is consistency. If consistency is not present, an endeavor will become fruitless, and its benefits won’t become a reality. This is true for strength training, weight loss, and in the case of this article, meditation. Therefore, addressing how to stick to a meditation practice is just as important as addressing what the practice consists of. In the initial stages of a meditation practice, it’s more important to simply do meditation than it is to create the perfect environment or to hold the best posture. An individual will only be motivated to meditate if they believe that meditation can benefit them in a meaningful way. Once an individual develops a personal connection with meditation, they can then begin to work on developing consistency in their practice (i.e. build a habit), without worrying too much about when, where, or how to meditate. Once an individual develops a foundational meditation habit, they are in a better position to start considering and implementing the best ways to meditate in terms of when, where, and how. *This article focuses specifically on Step 2. For Step 1, my article The Benefits of Breathing Meditation for Stress Management may be helpful. When it comes to practicing meditation on a daily basis, it is important to realize that the will to meditate may not occur spontaneously, even if you think meditation is important for you to do. In fact, it is likely that you may have to force yourself to initiate meditation, especially in the beginning stages of your practice. That is why it is important to begin your meditation practice in a way that is simple and easy. Start meditating in very short durations so that you have no excuse to not meditate. Progressively increase the duration of your meditation sessions in very small increments so that you allow yourself to comfortably adapt to the unfamiliar territory of an unstimulating environment. By repeatedly meditating in short durations, you will gradually develop a meditation habit. With time, you will develop the skills to meditate for longer durations. Week 1: Meditate for 1 minute every day. Week 2: Meditate for 2 minutes every day. Week 10: Meditate for 10 minutes every day. You are free to not meditate one day per week, if you so choose. Each meditation session will be continuous (e.g. on week 10, don’t partition the meditation sessions into x2 five minute sessions, or x5 two minute sessions). Use a timer to control the duration of the meditation sessions (ideally a timer with a soft-sounding alarm). When meditating, do your best to find an environment that is free of as much external stimuli as possible (e.g. sounds, smells, fluctuations in lighting). However, the environment does not need to be perfect! Don’t let the absence of a perfectly serene environment deter you from meditating. Find a comfortable position to meditate in: sitting upright, sitting reclined, sitting cross-legged, or lying down. You can use a chair, mat, meditation pillow, or bed. If you get sleepy easily, avoid the more horizontal positions and bed. For the duration of the meditation session, simply focus on the sensation of your breath. When you catch your mind wandering, bring your attention back to your breath. As you go about the 10 week habit-building program, you will intuitively start to see how you can fit meditation into your life. You will develop a personalized understanding of the best way for you to meditate (i.e. when, where, and how). If you have a history of practicing meditation, but find yourself lacking consistency, this program can be used to jumpstart a dormant practice. I’ve used it in such a way more than once. The popular portrayal of meditation (i.e. sitting cross-legged with perfect posture and complete focus in a perfectly serene environment) is largely a romanticized fallacy that discourages people from meditating because it presents an inaccessible idea of what meditation is. After a habit is established, a meditation duration of approximately 15-30 minutes per day on most days of the week is recommended in order to experience the significant benefits of meditation. However, meditation sessions as short as just a few minutes can make a notable difference. Remember, it’s better to meditate frequently for short durations than it is to meditate infrequently for long durations. In its simplest form, meditation is a practice of quietly observing the present moment. The “present moment” refers to both the outer world of sensory experience (e.g. sights, smells, body sensations), as well as the inner world of the mind (e.g. thoughts, beliefs, emotions). Meditation is not inherently religious; it does not require one to subscribe to a specific set of beliefs. There are many forms of meditation, but most focus on the breath as a way to anchor one’s conscious attention to the present moment. It should be noted that physiology (i.e. bodily function) and psychology (i.e. beliefs, thoughts, perspectives, and emotions) are not two distinct realms that operate independently from one another, but rather, they operate interdependently. The contents and patterns of the mind can shape the way the body functions, and vice versa. If one receives a high dose of caffeine from drinking too much coffee, there will be a significant release of the stress hormones cortisol  and epinephrine  into the blood stream. As a result of these hormones circulating in the blood, there will be an increase in heart rate, respiratory rate, blood pressure, sensory sensitivity, and threat perception. There is nothing inherently dangerous or threatening about drinking a large cup of coffee, yet, doing so can cause certain individuals to become gripped by a state of deep anxiety due to the acute physiological shift caused by caffeine. Ruminating on a stressful thought, such as speaking in front of a crowd of strangers, can elicit a release of the same stress hormones mentioned in the previous example (cortisol and epinephrine) [1,16,17]. Again, there will be an increase in heart rate, respiratory rate, blood pressure, sensory sensitivity, and threat perception. In this case, a completely imaginary situation, in which there is no actual physical threat, can cause an acute physiological response. Attention is directed towards the breath, without forcibly alerting it on a conscious level. Breathing will likely slow down, but as a result of shifts in the nervous system instead of conscious control. Whenever you recognize that your mind has been wandering, bring your attention back to the breath. Objectively view the formation and dissolution of your thoughts, without feeling responsible for them, and without judging them as “good” or “bad”. Note the emotional responses to your thoughts. Do your thoughts impulsively make you feel happy, sad, angry, frustrated, hopeless, or excited? Again, avoid judgement. Avoid viewing your emotional responses as “good” or “bad”. The diaphragm is consciously engaged in order to fully expand the lungs. Breathing is performed in a slow and controlled manner. To accomplish this, air is typically inhaled through the nose and exhaled through pursed lips. Attention is directed towards the sensation of the belly expanding and collapsing during breathing. During inhalation and exhalation, there is a visually recognizable expansion and collapse of the belly, respectively. Meditation is meant to be simple; it is about focusing on the immediate experience. Therefore, concerning yourself with abstract ideas about “what meditation is supposed to be” or “what meditation is supposed to do” will only hinder the practice. Keep in mind that Mindfulness Breathing Meditation and Diaphragmatic Breathing Meditation do not have to be mutually exclusive in every respect. For example, you can still use the mindfulness approach when breathing slowly with the diaphragm. You may wonder, “what kind of meditation is best?” The answer to that is: whatever kind appeals to you the most, because that is the kind you are most likely to do on a regular basis. Before I go into how Breathing Meditation can help manage stress, I will explain what stress is, and why it is important to manage it. Outside of scientific research, “stress” tends to be an ambiguous term, and even in the realm of science, “stress” has a range of definitions. But put into its simplest terms, stress is something that brings your body outside of its normal balance. As a result, stress requires a response (physical, psychological, or both), in order to return the body to balance. If you go for a walk on a 100 degree day, you will experience a heat stress that will require your body to make a change (i.e. adapt) in order to maintain a healthy core temperature. So as a result, you will start to sweat, and the water on the surface of your skin will absorb your own body heat and evaporate, effectively cooling your body (assuming it’s a dry day). If you keep sweating for a prolonged period of time, your blood volume will decrease notably, and you’ll have another homeostatic perturbation on your hands. Your body will respond by eliciting the sensation of thirst, so that you will drink water and restore your blood volume to a healthy level. In this chain of events, your body smoothly orchestrates several physiological processes in order to maintain a healthy balance when faced with stress. You are lazily walking through the woods, lost in a daydream, when a strong storm suddenly passes over you. The trees around you start violently bending and creaking. You imagine a huge tree falling on you. This frightful idea causes your body to release stress hormones that increase available energy in the blood, and make you hypervigilant of your surroundings. You continue to walk through the woods, but on high alert. After some time passes, despite the deafening sound of blowing wind and pouring rain, you hear a crack and a rushing noise behind you, which you easily hear because of your heightened senses. Due to the concentration of available energy in your blood, you are able to sprint away before a huge tree falls on you. In both of these cases, you can see that stress is not inherently a bad thing. Stress is part of life. In fact, the body needs to experience a healthy amount of stress in order to survive and flourish. So if stress makes you more resilient, why is it a problem that needs to be managed? Stress is not the problem, chronic stress is, and in our particular culture, chronic psychological stress. We live in an environment that differs greatly than the one we evolved to flourish in. We now have a dense population, commutes (across land, water, and air), bills, deadlines, rigid & unhealthy cultural expectations, highly advanced warfare, inundation of advertisements, global concerns, and endless complications – all things that increase the frequency at which we become stressed. Luckily, humans are highly adaptive organisms that can learn to cope in a variety of environments. However, we still carry physiological and psychological baggage that we evolutionarily collected from living in raw nature for most of our species’ history. Humans aren’t wired to effectively cope with the abstract psychological stresses of modern society. As a result, we are likely to experience the repeated activation of the sympathetic nervous system. Sympathetic Nervous System (SNS) – A component of the nervous system that is responsible for helping you evade a threat. Activation of the SNS increases: heart rate, respiratory rate, blood pressure, availability of usable energy, sensory sensitivity, and threat perception (i.e. vigilance). Activation of the SNS decreases blood flow to digestive organs. SNS activation is commonly known as the “fight or flight” response. Parasympathetic Nervous System (PNS) – A component of the nervous system that is responsible for facilitating digestion and recovery. Activation of the PNS decreases: heart rate, respiratory rate, blood pressure, availability of usable energy, sensory sensitivity, and threat perception (i.e. vigilance). Activation of the PNS increases blood flow to digestive organs and encourages tissue recovery. Activation of the PNS elicits a state of “rest and digest”. Reciprocal Relationship between SNS and PNS – As you may have surmised, the SNS and PNS, more or less, elicit opposite effects on the body. The ability to switch back and forth from SNS dominance and PNS dominance is a sign of a healthy nervous system that can effectively adapt to stress. Problems occur if either the SNS or PNS become overactive. This article addresses what happens when the SNS gets “stuck” in the “on position”. The SNS does not recognize the difference between imminent physical threats and frightening abstract ideas [10,17]. So whether you are walking across a pond covered in thin ice, or worrying about losing your health insurance coverage, your SNS will respond in the same way. As previously mentioned, our society offers a wealth of things to be psychologically stressed about, leading many individuals to experience frequent activation of the SNS. In addition, frequent activation of the SNS can lead to chronic hyperventilation. Chronic hyperventilation negatively affects blood chemistry and neuronal function, which can result in increased muscle tension, irritability, and sensitivity to light, sound, and pain . Now the pressing question is: how does one learn to cope with stress? The goal of stress management is to reduce the frequency and intensity of the SNS response. In other words, you want to activate the SNS less often, and you want those activations to be less powerful. This means you will want to avoid unnecessarily stressful situations (e.g. watching the news before bed), and also learn to better respond to unavoidable stressful situations (e.g. commuting in traffic). For example, some people react to making a mistake by spiraling into negative self-judgement (thoughts) and anger (feelings), which elicits an SNS response. Objectively examine your lifestyle and “mindstyle” in order to identify behaviors and thought patterns that tend to cause unnecessary stress. Example of an unnecessary thought pattern: Some people may find themselves reliving events long-past about which they felt dissatisfied, angry, or embarrassed. This is an unnecessary stress, since there is nothing that can be done about the past. Example of an unnecessary behavior: Some people find themselves in a perpetual state of frantic rushing due to poor time management. The key concept here is awareness, for you cannot solve a problem that you do not know exists. As previously mentioned, activation of the SNS increases threat perception (i.e. vigilance). Being able to better perceive threats, immediate or potential, is an important survival mechanism. You are going to hike through a jungle that you know is infested with highly venomous snakes. Due to anticipation of a threat (i.e. venomous snake bite), your SNS activates, increasing sensitivity to sensory input so that you are better able to detect sights, sounds, and tactile sensations that could be a snake. You are calmly hiking down a mountain trail, nearing your car. A grizzly bear suddenly charges you from a distance. Due to the immediate threat, your SNS activates, flooding your blood stream with stress hormones and immediately-usable energy, allowing you to sprint to your car as quickly as possible. If you didn’t have a strong SNS response in either of these situations, you would be less likely to survive them. The SNS helps protect you from imminent physical threats. After the threat is avoided, SNS activity decreases, and you carry on in a relatively stress-free manner. However, imminent physical threats are not common in the modern world. Yet, due to chronic psychological stress, many humans still experience the same SNS response as if there were a chronic physical threat, making them experience the world with a heightened threat perception. In other words, the world is perceived through a lens of fear. As a result, many of us go about our days anxiously, anticipating some sort of impending danger, whether we realize it or not. If we can’t pinpoint something that is dangerous, we project our fear out into the world, leading us to tendencies of control, suspicion, and insecurity. With an overactive SNS, you are more likely to assume people, places, and things as dangerous or threatening in some way (you’re always waiting for the other shoe to drop). The practice of Breathing Meditation can reduce SNS activity and increase PNS activity [1,5,24], causing a reduction in threat perception and anxiety [8,9,10,11]. Breathing Meditation increases the ability to see the world without fixating on unreasonable fears; it helps one to become more aware of positive possibilities, instead of negative ones. One sees life through a different lens than that of fear. Perceptions shape beliefs, and beliefs shape behavior. Since Breathing Meditation alters perceptions, there are powerful implications for behavior change. A man spills a cup of coffee on a white rug and immediately realizes that a mistake has been made which can’t be undone. Instead of getting upset, he decides to calmly clean up the mess. The man is able to remain calm because he has a keen awareness of his inner emotional state after spilling the coffee. He is able to occupy a mental space where he sees two potential paths. Engage with the negative emotions (i.e. anger, frustration, and self-criticism) that spring from the mind impulsively, thus activating the SNS and effectively ruining his mood for the following few hours. Realize the “bubbling up” of the negative emotions, and decide to direct attention towards what can be done to clean up the mess, instead of ruminating on the fact that a mistake has been made. The man chose path 2 (responding), because he realizes that engaging with his negative emotions is a completely fruitless decision that only leads to a stress-response, continued negative thinking, and likely another silly mistake. Attaching to, engaging with, or paying attention to negative emotions tends to prolong and intensify them. Individuals who consistently practice MBM are better at regulating their attention and disengaging from negative thinking [3,13]. Consistent meditation grants you a “buffer” against negative thoughts and emotional impulses, allowing you a space to consider your options so that you can choose to respond to stressful situations, instead of reacting to them. This is, in my opinion, one of the most profound benefits of meditation for stress management. MBM can help you achieve an objective perspective on your lifestyle, making it possible to recognize unnecessary stresses. A consistent practice of MBM can increase your ability to detect when negative emotional impulses arise, so that you can recognize what triggers them. For example, if you notice yourself getting stressed out when you watch the nightly news before bed, you have recognized a stress trigger, and you can then simply cut that unnecessary habit from your life. Stress that leads to fear. Fear that leads to avoidance of stressful situations (real or perceived). Avoidance that weakens the ability to cope with stressful situations. The inability to cope with unavoidable stressful situations leads to more stress. Stress leads to fear, and the cycle continues, slowly degrading the anxious individual’s ability to cope with stress so that he/she gradually retreats from normal life activities. This is the sort of loop that those with anxiety disorders commonly experience. MBM can help break the cycle of negative thinking [4,12], catastrophizing of stressful situations , and avoidance behavior , helping those with anxiety disorders to better cope with stress. Coping with stress is an adaptive skill; it weakens with lack of use, and becomes stronger when used. Breathing Meditation is remarkably cost effective because its physiological and psychological benefits have been scientifically validated, and it is free . Not only that, but you can perform Breathing Meditation in nearly any situation, as it just requires attention to the breath (something that is always occurring within you). You always have the ability to focus on, or slow, your breathing while paying attention to the present moment. The negative effects of meditation are very limited . However, there have been a few reports of individuals experiencing psychotic or manic events when overusing or misusing meditation, but these individuals either had, or likely had, previously existing psychiatric disorders [27,28]. The scientific study of meditation examines the complex relationship between psychology, behavior, and physiology, making it difficult to pinpoint causal mechanisms. In other words, it’s hard to specifically claim that “x-kind of meditation causes y-effects”. The study of meditation, and even physiology, is much more “fuzzy” than, say, physics. Contemporary meditation research looks to understand the effects of meditation by measuring quantitative physiological factors, such as brain wave activity, blood pressure, heart rate, heart rate variability, respiratory rate, hormone & neurotransmitter secretion, and indicators of glycemic control (i.e. insulin, blood glucose, and HbA1c), as well as qualitative factors associated with anxiety and depression. The individual’s interaction with meditation is highly variable. Therefore, it is challenging to reliably give different study-participants the same meditation intervention (i.e. trans-participant intervention-repeatability), and a single participant the same meditation intervention recurrently over time (i.e. inter-participant intervention-repeatability). A meditation intervention is different than, say, giving each participant a 100 mg pill of caffeine, and then studying the physiological changes that occur. Meditation cannot be “dosed” in a highly controlled and precise fashion. It is also difficult to ensure that all study-participants are complying with a study’s prescribed meditation intervention. When a group of individuals meditate, they can all look the same to the outside observer, but the inner processes of attention regulation and breath control can be quite different between the individuals. Studies on meditation tend to have a small sample size (i.e. a small amount of people participating in the studies). Due to this, it can be difficult to extrapolate the results of the study to the general population. The scientific study of meditation is a relatively new field, so there is still much to be learned in the design and implementation of experiments investigating the effects of meditation. A common sentiment regarding stress is, “it’s all in your head”. While stress influences the psyche (and vice versa), stress is not exclusively “in the head”; it’s also in the body. Stress, regardless of its origin, alters the body’s physiology due to activation of the sympathetic nervous system (SNS). Chronic stress, and the consequential frequent activation of the SNS, increase the risk of several diseases and disorders. Therefore, the ability to effectively cope with stress is an essential skill for healthy living. Forms of Breathing Meditation, such as Mindfulness Breathing Meditation (MBM) and Diaphragmatic Breathing Meditation (DBM) can play a powerful role in the management of stress by decreasing both the frequency and intensity of the SNS stress-response. The ability to shift one’s attention towards the breath is always accessible, making Breathing Meditation an excellent method for managing stress. 1.) Chaiopanont, S. (2008). Hypoglycemic effect of sitting breathing meditation exercise on type 2 diabetes at Wat Khae Nok Primary Health Center in Nonthaburi province. Medical Journal of the Medical Association of Thailand, 91(1), 93. 2.) Rosenzweig, S., Reibel, D. K., Greeson, J. M., & Edman, J. S. (2007). Mindfulness-based stress reduction is associated with improved glycemic control in type 2 diabetes mellitus: a pilot study. Alternative Therapies in Health and Medicine, 13(5), 36. 3.) Burg, J. M., Wolf, O. T., & Michalak, J. (2012). Mindfulness as self-regulated attention. Swiss Journal of Psychology. 4.) Erisman, S. M., & Roemer, L. (2010). A preliminary investigation of the effects of experimentally induced mindfulness on emotional responding to film clips. Emotion, 10(1), 72. 5.) Tang, Y. Y., Ma, Y., Fan, Y., Feng, H., Wang, J., Feng, S., ... & Zhang, Y. (2009). Central and autonomic nervous system interaction is altered by short-term meditation. Proceedings of the National Academy of Sciences, 106(22), 8865-8870. 6.) Barnhofer, T., Chittka, T., Nightingale, H., Visser, C., & Crane, C. (2010). State effects of two forms of meditation on prefrontal EEG asymmetry in previously depressed individuals. Mindfulness, 1(1), 21-27. 7.) Barnes, V. A., Pendergrast, R. A., Harshfield, G. A., & Treiber, F. A. (2008). Impact of breathing awareness meditation on ambulatory blood pressure and sodium handling in prehypertensive African American adolescents. Ethnicity & Disease, 18(1), 1. 8.) Arias, A. J., Steinberg, K., Banga, A., & Trestman, R. L. (2006). Systematic review of the efficacy of meditation techniques as treatments for medical illness. Journal of Alternative & Complementary Medicine, 12(8), 817-832. 9.) Garland, E. L. (2007). The meaning of mindfulness: A second-order cybernetics of stress, metacognition, and coping. Complementary Health Practice Review, 12(1), 15-30. 10.) Paul, G., Elam, B., & Verhulst, S. J. (2007). A longitudinal study of students' perceptions of using deep breathing meditation to reduce testing stresses. Teaching and Learning in Medicine, 19(3), 287-292. 11.) Vøllestad, J., Sivertsen, B., & Nielsen, G. H. (2011). Mindfulness-based stress reduction for patients with anxiety disorders: Evaluation in a randomized controlled trial. Behaviour Research and Therapy, 49(4), 281-288. 12.) Burg, J. M., & Michalak, J. (2011). The healthy quality of mindful breathing: associations with rumination and depression. Cognitive Therapy and Research, 35(2), 179-185. 13.) Feldman, G., Greeson, J., & Senville, J. (2010). Differential effects of mindful breathing, progressive muscle relaxation, and loving-kindness meditation on decentering and negative reactions to repetitive thoughts. Behaviour Research and Therapy, 48(10), 1002-1011. 14.) Lovallo, W. R., Whitsett, T. L., al'Absi, M., Sung, B. H., Vincent, A. S., & Wilson, M. F. (2005). Caffeine stimulation of cortisol secretion across the waking hours in relation to caffeine intake levels. Psychosomatic Medicine, 67(5), 734. 16.) McCullough, M. E., Orsulak, P., Brandon, A., & Akers, L. (2007). Rumination, fear, and cortisol: An in vivo study of interpersonal transgressions. Health Psychology, 26(1), 126. 17.) Sapolsky, R. M. (2004). Why zebras don't get ulcers: The acclaimed guide to stress, stress-related diseases, and coping-now revised and updated. Holt paperbacks. 18.) Kabat-Zinn, J. (1990). Full catastrophe living: The program of the stress reduction clinic at the University of Massachusetts Medical Center. 19.) Abramowitz, J. S. (1996). Variants of exposure and response prevention in the treatment of obsessive-compulsive disorder: A meta-analysis. Behavior Therapy, 27(4), 583-600. 20.) Adam, T. C., & Epel, E. S. (2007). Stress, eating and the reward system. Physiology & Behavior, 91(4), 449-458. 21.) Groesz, L. M., et al. (2012). What is eating you? Stress and the drive to eat. Appetite, 58(2), 717-721. 22.) Torres, S. J., & Nowson, C. A. (2007). Relationship between stress, eating behavior, and obesity. Nutrition, 23(11), 887-894. 23.) Timmons, B. H., & Ley, R. (Eds.). (1994). Behavioral and psychological approaches to breathing disorders. Springer Science & Business Media. 24.) Jerath, R., Edry, J. W., Barnes, V. A., & Jerath, V. (2006). Physiology of long pranayamic breathing: neural respiratory elements may provide a mechanism that explains how slow deep breathing shifts the autonomic nervous system. Medical Hypotheses, 67(3), 566-571. 25.) Moss, D. (2004). Heart rate variability (HRV) biofeedback. Psychophysiology Today, 1(1), 4-11. 26.) Shear, M. K., Bjelland, I., Beesdo, K., Gloster, A. T., & Wittchen, H. U. (2007). Supplementary dimensional assessment in anxiety disorders. International Journal of Methods in Psychiatric Research, 16(S1). 27.) Chan-Ob, T. I. N. N. A. K. O. R. N., & Boonyanaruthee, V. U. D. H. I. C. H. A. I. (1999). Meditation in association with psychosis. Medical Journal of the Medical Association of Thailand, 82(9), 925-30. 28.) Walsh, R., & Roche, L. (1979). Precipitation of acute psychotic episodes by intensive meditation in individuals with a history of schizophrenia. The American Journal of Psychiatry. As humans age into older adulthood (age 65 and over), a variety of physiological changes occur that contribute to a process of deteriorating physical and cognitive function (Evans, 1997; Persson et al., 2006). As a result, a general condition of frailty can occur in older adults (Torpy, Lynm, & Glass, 2006). Older adults who become frail are less independent than those who are not, because frail older adults have a greater probability of hospitalization, health problems, and being disabled (Torpy et al., 2006). Frail older adults also have a limited functional capacity, which is defined as the capacity to complete basic human tasks that are essential to everyday living (Evans, 1997; Clark & Manini, 2010; Boström et al., 2014). Frailty in older adults is of particular concern in the U.S. due to an unprecedented percentage of the population shifting into older adulthood (Knickman & Snell, 2002). In 2030, the elderly population will be doubled in size compared to the year 2000, and it is estimated that one-fifth of the total American population will be 65+ years old (Knickman & Snell, 2002; Anderson, Goodman, Holtzman, Posner, & Northridge, 2012). Due to the future influx of older adults in the U.S., health care costs are projected to increase significantly (Schneider & Guralnik, 1990). A variety of deteriorative physiological changes occur as humans enter older adulthood, and those changes can lead to frailty (Evans, 1997; Persson et al., 2006; Torpy et al., 2006). Two of those deteriorative changes are sarcopenia, i.e. loss of muscle mass, and dynapenia, i.e. loss of muscle strength (Evans, 1997; Clark & Manini, 2010). A decrease in both muscle mass and muscle strength degrades the body’s ability to move and stabilize effectively, which therefore contributes to frailty. Frailty can then lead to decreased functional capacity and independence in older adults (Torpy et al., 2006; Evans, 1997; Clark & Manini, 2010). A more subtle deteriorative change caused by aging is the degradation of cognitive function (Persson et al., 2006). Cognitive function is a person’s ability to engage in mental capabilities such as memory, problem solving, and information processing (Daffner, 2010). Cognitive function is an important aspect of functional capacity, as a well-functioning musculoskeletal system is useless if the “operator” cannot effectively control it. When attempting to positively impact functional capacity and independence in older adults, it is shortsighted to not consider cognitive function because degradation of cognitive function is a contributor to frailty (Torpy et al., 2006). Therefore, a focus on both physical and mental improvements is necessary when increasing functional capacity and independence in older adults. See figure 1 for a summary of how aging contributes to frailty. Considering cognitive function’s relationship to functional capacity and independence in older adults is especially important due to the existence of dementia. Dementia is a mental disorder that often leads to disability in older adults by causing degraded cognitive processes, and it is a highly prevalent disease in the older adult population (Fratiglioni, De Ronchi, & Agüero-Torres, 1999; Agüero-Torres et al., 1998; Gustafson, 1996). A large prevalence of dementia comes with important economic and public health implications, especially considering the inevitable influx of older adults in the U.S. population in coming years (Fratiglioni et al., 1999; Knickman & Snell, 2002). Resistance exercise is a form of physical activity that involves the generation of musculoskeletal force directed against some form of external resistance (Weil, n.d.). The external resistance is commonly in the form of barbells, dumb bells, resistance machines, elastic bands, or one’s own bodyweight (Weil, n.d.). Resistance exercise involves repetitive movements that are usually performed in periods of exertion called “sets” (Weil, n.d.). The sets are then separated by rest intervals that allow for partial muscle recovery (Weil, n.d.). In the older adult population, resistance exercise has been found to cause many positive effects, including: anabolic hormonal response, increased muscle mass, increased muscle strength, and increased cognitive function (Kraemer & Ratamess, 2005; Peterson, Sen, & Gordon, 2011; Peterson, Rhea, Sen, & Gordon, 2010; Heyn, Abreu, & Ottenbacher, 2004). Figure 1: How aging contributes to frailty in older adulthood. 1. (Clark & Manini, 2010). 3. (Persson et al., 2006). Figure 1: Aging is a multifaceted process that has significant consequences on both physical and mental capabilities. The existence of frailty does not necessarily need all three components (muscle weakening, muscle loss, and decreased cognitive function), as long as one or more of the components leads to limited functional capacity and limited independence. Resistance exercise is an effective method in increasing functional capacity and independence in older adults. Resistance exercise can positively address sarcopenia and dynapenia by stimulating muscle growth and increasing muscle strength, respectively (Watanabe, Madarame, Ogasawara, Nakazato, & Ishii, 2013; Vincent et al., 2002). As a result of musculoskeletal improvements, older adults will experience decreases in frailty, or in other words, improvements in their functional capacity and independence (Vincent et al., 2002; Roma et al., 2013; Zhuang, Huang, Wu, & Zhang, 2014). Functional capacity is defined as the capacity to complete basic human tasks that are essential to everyday living, such as: locomotion, climbing/descending stairs, lifting/moving objects, balance, and accomplishing basic joint mobility (Boström et al., 2014). Of particular importance, increases in functional capacity can decrease the chance of falling-injuries in older adults (Zhuang et al., 2014). Resistance exercise has also been suggested to be able to improve the cognitive function in older adults (Van de rest et al., 2013). As a result of increased functional capacity and independence via improvements in musculoskeletal and cognitive function, future health care costs of older adults may decrease. It has been asserted that investing in the present day health of the baby boomer population may decrease future health care costs of this population when it reaches older adulthood (Knickman & Snell, 2002). Contribution is summarized in figure 2. Figure 2: Older adults who engage in resistance exercise and the positive results. 1. (Vincent et al., 2002). 2. (Watanabe et al., 2013). 3. (Van de rest et al., 2013). 5. (Zhuang et al., 2014). 6. (Knickman & Snell, 2002). Figure 2: The potential decrease in health care costs illustrated above would be experienced on both an individual and national level. Due to decreased disability and hospitalization costs in the older adult population, older adults would save on out-of-pocket money, and the state and federal government would save on Medicare and Medicaid costs (Knickman & Snell, 2002). There is general difficulty when the older adult population participates in studies which involve physical exertion due to the population’s age-related deterioration. When studying the relationship between the older adult population and resistance exercise, it is common for study-participants to drop out due to musculoskeletal and/or other health problems (Vincent et al., 2002; Delshad, Ghanbarian, Mehrabi, Sarvghadi, & Ebrahim, 2013; Zhuang et al., 2014). There exists a sort of paradox – if resistance exercise can increase functional capacity and independence in older adults by decreasing frailty, why does it also injure older adults? Resistance exercise is certainty not applicable to all sub-populations of older adults. Even within older adults who can perform resistance exercise, there are still adjustments and limitations to be made on an individual basis for safety during resistance exercise (Nelson et al., 2007). While resistance exercise can improve frailty in older adults, access to proper exercise facilities may be a challenge for frail older adults (Torpy et al., 2006). There is another paradox – resistance exercise may be an effective lifestyle choice for frail older adults, but the lack of independence and functional capacity may inhibit older adults’ access to training facilities in which they would engage in resistance exercise. Frail older adults who use resistance exercise may require professional supervision and instruction. The problem is more complex than just facilitating access to exercise facilities for frail older adults. It is important to state that there must be a distinction between resistance exercise programs between older adults at risk for frailty, and older adults who are currently frail. Some exercise programs used to prevent frailty in not-yet-frail older adults may actually increase frailty in currently frail older adults (Faber, Bosscher, Chin A Paw, & van Wieringen, 2006). Functional capacity is the capacity to complete basic human tasks that are essential to everyday living (Boström et al., 2014). Common examples of functional capacity include ascending & descending stairs, standing up from a seated position, and basic joint mobility actions such as reaching overhead, bending over, and sagittal & transverse movements of the spine. Resistance exercise improves functional capacity by counteracting the muscle wasting and muscle weakening effects of aging by stimulating muscle growth and muscle strength (Watanabe et al., 2013; Vincent et al., 2002). By building a strong physical foundation through increases in muscle size and strength, older adults’ functional capacity can improve (Vincent et al., 2002; Roma et al., 2013). Muscular strength is essential for a healthy functional capacity because muscles allow the human body to move, stabilize and manipulate external objects. Functional capacity depends greatly on proper muscular function because it is largely defined by the ability to move in practical ways with the goal of achieving basic activities essential to daily human life (Boström et al., 2014). Muscular strength is essential to functional capacity, and functional capacity is essential for independence. Therefore, resistance exercise can increase functional capacity and independence in older adults by increasing muscular strength. Interestingly, it has been found that increases in muscle strength can occur without gains in muscle size via neurological adaptations (Watanabe et al., 2013; Vincent et al., 2002; Romero-Arenas, Martínez-Pascual, & Alcaraz, 2013) However, gains in muscle size are important because they have been found to help prevent disease and improve immune function, both of which are important aspects of frailty prevention (Clark & Manini, 2010). Several studies have found that older adults who engage in low-intensity resistance exercise can achieve the same strength gains seen in high-intensity resistance exercise participants (Watanabe et al., 2013; Vincent et al., 2002; Van Roie, Delecluse, Coudyzer, Boonen, & Bautmans, 2013). This is an important finding, because less effort for the same result is a clear example of cost/benefit efficiency in resistance exercise training. Preventing falls in older adults is critical in maintaining independence, and falling often signals a deficit in functional capacity due to ineffective stability and strength. Falling in older adults can lead to hospitalization, functional impairment, fractures, and head injuries, all of which encourage frailty (Kannus et al., 2005). In extreme cases, falling can lead to death (Kannus et al., 2005). Resistance exercise gives older adults an opportunity to maintain their independence by decreasing the risk of falling. Resistance exercise can increase older adults’ ability to complete functional tasks such as ascending and descending stairs (Vincent et al., 2002; Rooks, Kiel, Parsons, & Hayes, 1997). Utilizing stairs is just one of many movement tasks that older people need to accomplish if they are to maintain independence. Resistance exercise can improve other essential movements such as walking and picking up objects from the floor by increasing neuromotor function and joint mobility (Rooks et al., 1997; Roma et al., 2013). There is ample research that has suggested the effectiveness of resistance exercise in increasing the functional capacity and independence of older adults. However, there are obstacles that hinder older adults from actually engaging in the practice of resistance exercise, and those obstacles need to be studied further. One of the obstacles is access to a training environment. Older adults not only need accessibility to training facilities, but they also need proper training instruction in order to avoid injuries that could contribute to frailty. After all, the goal of resistance exercise training is to decrease frailty. It has been found that exercise intended for preventing frailty in pre-frail older adults can actually increase frailty in already-frail older adults (Faber, Bosscher, Chin A Paw, & van Wieringen, 2006). Such cases of harmful resistance exercise programs need to be given due attention with further research. Comparative analyses of the effects of resistance exercise on pre-frail vs. frail older adults needs to be done in order to better understand how to prevent harmful resistance exercise programs. To avoid prescribing harmful exercise, non-medical health & exercise professionals who work with older adults should be well educated on the differences between pre-frail and frail older adults. Also, having an effective knowledge of the specific sub-populations of older adults would improve non-medical health & exercise professionals’ ability to refer out their older adult clients to the proper medical professional, if necessary. Similarly, medical professionals need to be well-versed in communicating the needs of older adult patients to the non-medical health & exercise professionals who work with the older adults. In the care of frail older adults, educational programs that bridge the gap between doctor and trainer need to exist for the optimal application of resistance exercise. Agüero-Torres, H., Fratiglioni, L., Guo, Z., Viitanen, M., von Strauss, E., & Winblad, B. (1998). Dementia is the major cause of functional dependence in the elderly: 3-year follow-up data from a population-based study. American Journal of Public Health, 88(10), 1452-1456. Anderson, L. A., Goodman, R. A., Holtzman, D., Posner, S. F., & Northridge, M. E. (2012). Aging in the United States: opportunities and challenges for public health. American Journal of Public Health, 102(3), 393-395. Boström, G., Conradsson, M., Rosendahl, E., Nordström, P., Gustafson, Y., & Littbrand, H. (2014). Functional capacity and dependency in transfer and dressing are associated with depressive symptoms in older people. Clinical Interventions in Aging, 9, 249. Brito, F., de Oliveira, C.V., Santos, S., & Santos, C. (2014). High-intensity exercise promotes postexercise hypotension greater than moderate intensity in elderly hypertensive individuals. Clinical Physiology and Functional Imaging, 34(2), 126-132. Cassilhas, R. C., Viana, V. A., Grassmann, V., Santos, R. T., Santos, R. F., Tufik, S. E. R. G. I. O., & Mello, M. T. (2007). The impact of resistance exercise on the cognitive function of the elderly. Medicine and Science in Sports and Exercise, 39(8), 1401. Clark, B. C., & Manini, T. M. (2010). Functional consequences of sarcopenia and dynapenia in the elderly. Current Opinion in Clinical Nutrition and Metabolic Care, 13(3), 271. Daffner, K. R. (2010). Promoting successful cognitive aging: a comprehensive review. Journal of Alzheimer's Disease, 19(4), 1101-1122. Delshad, M., Ghanbarian, A., Mehrabi, Y., Sarvghadi, F., & Ebrahim, K. (2013). Effect of strength training and short-term detraining on muscle mass in women aged over 50 years old. International Journal of Preventative Medicine, 4(12), 1386-1394. Evans, W. (1997). Functional and metabolic consequences of sarcopenia. The Journal of Nutrition, 127(5), 9985-10035. Faber, M. J., Bosscher, R. J., Chin A Paw, M. J., & van Wieringen, P. C. (2006). Effects of exercise programs on falls and mobility in frail and pre-frail older adults: a multicenter randomized controlled trial. Archives of Physical Medicine and Rehabilitation, 87(7), 885-896. Fratiglioni, L., De Ronchi, D., & Agüero-Torres, H. (1999). Worldwide prevalence and incidence of dementia. Drugs & Aging, 15(5), 365-375. Gustafson, L. (1996). What is dementia? Acta Neurologica Scandinavica, 94(s168), 22-24. Kannus, P., Sievänen, H., Palvanen, M., Järvinen, T., & Parkkari, J. (2005). Prevention of falls and consequent injuries in elderly people. The Lancet, 366(9500), 1885-1893. Kim, H. S., & Kim, D. G. (2013). Effect of long-term resistance exercise on body composition, blood lipid factors, and vascular compliance in the hypertensive elderly men. Journal of Exercise Rehabilitation, 9(2), 271-277. Knickman, J.R., & Snell, E.K. (2002). The 2030 Problem: Caring for aging baby boomers. Health Services Research, 37(4), 849-884. Kraemer, W.J., Ratamess, N.A. (2005). Hormonal responses and adaptations to resistance exercise and training. Sports Medicine, 35(4), 339-391. Lord, S. R., Ward, J. A., Williams, P., & Strudwick, M. (1995). The effect of a 12-month exercise trial on balance, strength, and falls in older women: a randomized controlled trial. Journal of the American Geriatrics Society, 43(11), 1198-1206. Maiorana, A., O'Driscoll, G., Cheetham, C., Collis, J., Goodman, C., Rankin, S.,…Green, D. (2000). Combined aerobic and resistance exercise training improves functional capacity and strength in CHF. Journal of Applied Physiology, 88(5), 1565-1570. Nelson, M. E., Rejeski, W. J., Blair, S. N., Duncan, P. W., Judge, J. O., King, A. C., ... Castaneda-Sceppa, C. (2007). Physical activity and public health in older adults: recommendation from the American College of Sports Medicine and the American Heart Association. Circulation, 116(9), 1094. Persson, J., Nyberg, L., Lind, J., Larsson, A., Nilsson, L. G., Ingvar, M., & Buckner, R. L. (2006). Structure–function correlates of cognitive decline in aging. Cerebral Cortex, 16(7), 907-915. Peterson, M. D., Rhea, M. R., Sen, A., & Gordon, P. M. (2010). Resistance exercise for muscular strength in older adults: a meta-analysis. Ageing Research Reviews, 9(3), 226-237. Peterson, M. D., Sen, A., & Gordon, P. M. (2011). Influence of resistance exercise on lean body mass in aging adults: a meta-analysis. Medicine and Science in Sports and Exercise, 43(2), 249. Rooks, D. S., Kiel, D. P., Parsons, C., & Hayes, W. C. (1997). Self-paced resistance training and walking exercise in community-dwelling older adults: effects on neuromotor performance. The Journals of Gerontology Series A: Biological Sciences and Medical Sciences, 52(3), M161-M168. Roma, M. F. B., Busse, A. L., Betoni, R. A., Melo, A. C. D., Kong, J., Santarem, J. M., & Jacob Filho, W. (2013). Effects of resistance training and aerobic exercise in elderly people concerning physical fitness and ability: a prospective clinical trial. Einstein (São Paulo), 11(2), 153-157. Romero-Arenas, S., Martínez-Pascual, M., & Alcaraz, P. E. (2013). Impact of Resistance Circuit Training on Neuromuscular, Cardiorespiratory and Body Composition Adaptations in the Elderly. Aging and Disease, 4(5), 256-263. Schneider, E. L., & Guralnik, J. M. (1990). The aging of America: impact on health care costs. The Journal of the American Medical Association, 263(17), 2335-2340. Tibana, R. A., Navalta, J., Bottaro, M., Vieira, D., Tajra, V., Silva, A. D., ...Prestes, J. (2013). Effects of eight weeks of resistance training on the risk factors of metabolic syndrome in overweight/obese women-“A Pilot Study”. Diabetology & Metabolic Syndrome, 28(11). Torpy, J. M., Lynm, C., & Glass, R. M. (2006). Frailty in older adults. The Journal of the American Medical Association, 296(18), 2280-2280.
van de Rest, O., van der Zwaluw, N. L., Tieland, M., Adam, J. J., Hiddink, G. J., van Loon, L. J., & de Groot, L. C. (2013). Effect of resistance-type exercise training with or without protein supplementation on cognitive functioning in frail and pre-frail elderly: Secondary analysis of a randomized, double-blind, placebo-controlled trial. Mechanisms of Ageing and Development, Epub ahead of print. Van Roie, E., Delecluse, C., Coudyzer, W., Boonen, S., & Bautmans, I. (2013). Strength training at high versus low external resistance in older adults: Effects on muscle volume, muscle strength, and force–velocity characteristics. Experimental Gerontology, 48(11), 1351-1361. Vincent, K.R., Braith, R.W., Feldman, R.A., Magyari, P.M., Cutler, R.B., Persin, S.A.,… Lowenthal, D.T. (2002). Resistance Exercise and Physical Performance in Adults Aged 60 to 83. Journal of the American Geriatrics Society, 50(6), 1100-1107. Watanabe, Y., Madarame, H., Ogasawara, R., Nakazato, K., & Ishii, N. (2013). Effect of very low‐intensity resistance training with slow movement on muscle size and strength in healthy older adults. Clinical Physiology and Functional Imaging, Epub ahead of print. Zhuang, J., Huang, L., Wu, Y., & Zhang, Y. (2014). The effectiveness of a combined exercise intervention on physical fitness factors related to falls in community-dwelling older adults. Clinical Interventions in Aging, 9, 131-140. Disclaimer: The information on this website is not intended to replace or supersede medical recommendations given to you by your physician. Please consult with your physician before making any significant changes to your diet or physical activity levels, especially if you have any preexisting conditions. Heart failure is a cardiovascular disease that is rising in incidence and becoming a significant public health concern [1,2]. Heart failure is the heart’s lack of ability to pump sufficient oxygenated blood throughout the body to meet normal oxygen requirements for metabolic processes . There are two primary ways in which heart failure can occur, abnormal cardiac anatomy and/or weakened cardiac function (specifically in the left ventricle) . An important defining factor in heart failure is the ejection fraction of the left ventricle . Ejection fraction is mathematically determined by [stroke volume/end diastolic volume], and the ejection fraction associated with heart failure is typically low (less than 50%) due to a low stroke volume and a high compensatory end diastolic volume . The lack of sufficient oxygen delivery throughout the body from heart failure causes a marked deficit in physical activity tolerance [2,3]. Symptoms of heart failure that limit physical activity include breathlessness, lethargy, angina, and arrhythmia [1,2,3]. It was previously suggested to individuals with heart failure that exercise should be limited, and inactivity encouraged, as to not overly stress the compromised cardiopulmonary system [1,4]. However, recent scientific evidence suggests that exercise is not only safe for individuals with heart failure, but often beneficial [1,2,4,5,6]. However, when creating an exercise program for those with heart failure, the specific physiological and psychological constraints associated with heart failure must be kept in mind to ensure safety and effectiveness [1,2,4,5,6]. The basic components of exercise programming include duration, frequency, intensity, and mode of training (aerobic and/or anaerobic), and each of these components must be tailored appropriately for those with heart failure [1,2,4,5,6]. Individuals with heart failure typically have an exceptionally low aerobic capacity due to insufficient oxygen consumption, so aerobic training is an effective tool to increase systemic oxygen transportation and utilization [1,2,5]. Those with heart failure must begin aerobic training at a low intensity and duration in order to not over-tax the weakened cardiopulmonary system, as even basic daily tasks can cause breathlessness and fatigue [1,2,4]. A starting aerobic intensity of 60% of max heart rate and starting exercise duration of 15-30 minutes has been found to be safe and effective in training the aerobic system in those with heart failure [1,4,5,6]. Heart rate monitors are a useful tool to ensure proper aerobic intensities [1,4]. An initial exercise frequency of 2-3 sessions per week is appropriate for those with heart failure [1,4,5,6]. As those with heart failure accumulate exercise volume over time, they can safely increase components of their training . Progressively increasing training difficulty can yield even greater aerobic benefits than simply maintaining difficulty [2,4]. After an initial 3 months of aerobic training at the previously prescribed values, those with heart failure can progressively increase their aerobic intensity to 70% max heart rate, exercise duration to 40 minutes, and exercise frequency to 4-5 sessions per week [1,2]. Cycling and walking are acceptable forms of aerobic exercise [1,2,6]. Due to insufficient oxygen consumption derived from a weakened cardio-pulmonary system, those with heart failure can improve oxygen transportation and utilization via aerobic exercise [1,2,5]. Improvements in aerobic capacity can reduce adverse symptoms associated with heart failure, improve quality of life, increase lifespan, and reduce hospitalizations [1,2,4,6]. 1.) O’Connor, C. M., Whellan, D. J., Lee, K. L., Keteyian, S. J., Cooper, L. S., Ellis, S. J., ... & HF-ACTION Investigators. (2009). Efficacy and safety of exercise training in patients with chronic heart failure: HF-ACTION randomized controlled trial. The Journal of the American Medical Association, 301(14), 1439-1450. 2.) European Heart Failure Training Group (1998). Experience from controlled trials of physical training in chronic heart failure Protocol and patient factors in effectiveness in the improvement in exercise tolerance. European Heart Journal, 19, 466-475. 3.) McMurray, J. J., Adamopoulos, S., Anker, S. D., Auricchio, A., Böhm, M., Dickstein, K., ... & Ben Lamin, H. A. (2012). ESC Guidelines for the diagnosis and treatment of acute and chronic heart failure 2012. European Journal of Heart Failure, 14(8), 803-869. 4.) Wielenga, R. P., Huisveld, I. A., Bol, E., Dunselman, P. H. J. M., Erdman, R. A. M., Baselier, M. R. P., & Mosterd, W. L. (1999). Safety and effects of physical training in chronic heart failure. Results of the Chronic Heart Failure and Graded Exercise study (CHANGE). European Heart Journal, 20(12), 872-879. 5.) McKelvie, R. S., Teo, K. K., Roberts, R., McCartney, N., Humen, D., Montague, T., ... & Yusuf, S. (2002). Effects of exercise training in patients with heart failure: the Exercise Rehabilitation Trial (EXERT). American Heart Journal, 144(1), 23-30. 6.) ExTraMATCH Collaborative (2004). Exercise training meta-analysis of trials in patients with chronic heart failure (ExTraMATCH). British Medical Journal, 328(7433), 189. High blood pressure, or hypertension (defined as a blood pressure equal to or greater than 140/90 mm Hg), is a prevalent problem in America. Americans tend to consume excessive amounts of dietary sodium, with men consuming more than women [1,2]. Sodium consumption is purported to be an important factor in the incidence of hypertension [3,4]. However, the exact role that sodium plays in hypertension is not clear [3,5]. The independent effect of sodium in hypertension is difficult to denote when many other factors affect hypertension, such as bodyweight, genetics, age, and stress levels [3,5]. Preventing and reducing hypertension is an important public health concern, as hypertension increases the risk of stroke and a variety of cardiovascular dysfunctions [2,3,6]. According to a variety of research, it appears that certain individuals are more susceptible to developing hypertension due to excessive sodium consumption than others. Obesity, older age, and sodium sensitivity are all factors that increase the likelihood of developing hypertension as a result of excessive sodium consumption, and individuals with those characteristics will benefit from limiting dietary sodium [3,5,7]. Those who are younger, at a healthy weight, and not sodium sensitive are less likely to develop hypertension as a result of excessive sodium consumption, and these individuals do not need to be overly concerned with limiting dietary sodium [3,5,7]. Sodium sensitivity and sodium resistance are phenomena that are at least partially regulated by the renin-angiotensin-aldosterone system (RAAS), as the hormones renin and aldosterone play an important role in the blood pressure response due to sodium consumption . However, there is no definite conclusion on what underlies sodium sensitivity . The RAAS response can vary between individuals . Sodium resistant individuals’ RAAS responds with a significant decrease in renin and aldosterone levels when excessive sodium consumption occurs, while sodium sensitive individuals have a markedly lesser reduction in renin and aldosterone in the same scenario . Hypertension increases the risk of stroke and cardiovascular dysfunction, and these risks are even greater in obese people with hypertension [2,3,6]. Obesity also appears to play a role in the RAAS response to excessive sodium consumption . Obesity makes the body more sodium sensitive, placing obese people who consume sodium excessively at a greater risk for hypertension and therefore cardiovascular dysfunction . There is a clear positive correlation between age and hypertension, and older adults tend to be more susceptible to sodium induced hypertension [2,5]. Interestingly, older adults tend to experience greater reductions in high blood pressure as a result of limiting dietary sodium compared to younger people . Dietary sodium limitation is beneficial in preventing and reducing hypertension in those with any or all of the following factors: obesity, older age, and sodium sensitivity [3,5,7]. Dietary sodium limitation is not overly important in those who are normal weight, younger, and sodium resistant [3,5,7]. 1.) Morris, M. J., Na, E. S., & Johnson, A. K. (2008). Salt craving: the psychobiology of pathogenic sodium intake. Physiology & behavior, 94(5), 709-721. 2.) du Cailar, G., Ribstein, J., & Mimran, A. (2002). Dietary sodium and target organ damage in essential hypertension. American journal of hypertension, 15(3), 222-229. 4.) Dahl, L. K., & Love, R. A. (1957). Etiological role of sodium chloride intake in essential hypertension in humans. Journal of the American Medical Association, 164(4), 397-400. 5.) Law, M. R., Frost, C. D., & Wald, N. J. (1991). By how much does dietary salt reduction lower blood pressure? I--Analysis of observational data among populations. British Medical Journal, 302(6780), 811. 6.) National High Blood Pressure Education Program. (2004). The seventh report of the Joint National Committee on prevention, detection, evaluation, and treatment of high blood pressure. 7.) Shin, S. J., Lim, C., Oh, S. W., & Rhee, M. Y. (2014). The unique response of renin and aldosterone to dietary sodium intervention in sodium sensitivity. Journal of Renin-Angiotensin-Aldosterone System, 1470320314526437. 8.) Law, M. R., Frost, C. D., & Wald, N. J. (1991). By how much does dietary salt reduction lower blood pressure? III--Analysis of data from trials of salt reduction. British Medical Journal, 302(6780), 819.